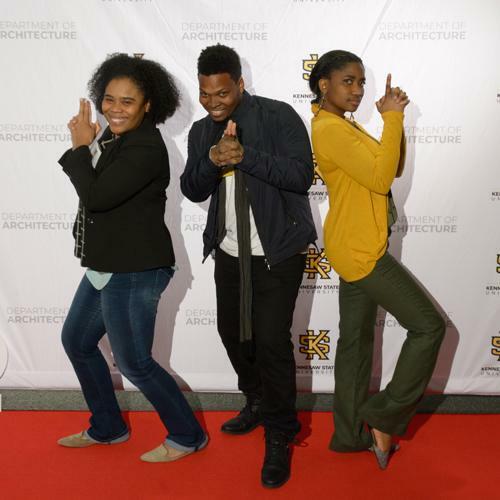 Kennesaw State University’s Department of Architecture has named two fifth-year students as co-winners of the inaugural Portman Prize for Outstanding Thesis, awarded to those who best exemplify comprehensive research and design excellence as determined by a panel of experts. 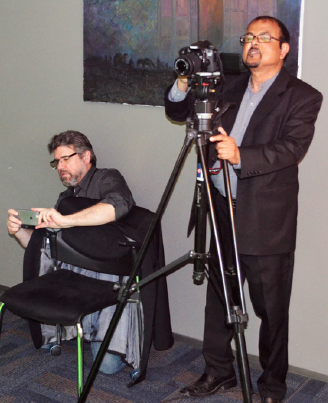 Varshil Patel and Darral Tate each received $2,000 as first-place winners in the competition. Jeremy Bowen, who finished runner-up, was awarded $1,000. 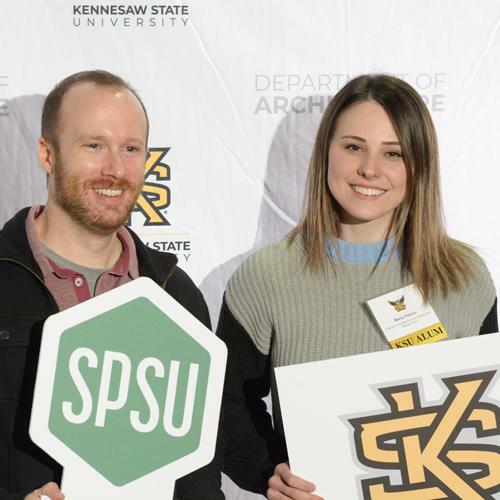 The competition featured 10 Kennesaw State students and a jury of seven professionals and academics from across the U.S.
With the event, KSU joins the Georgia Institute of Technology and Harvard University as the only institutions to award the Portman Prize. In addition to the prize money, the first-place winners are offered a summer internship with award sponsor John Portman & Associates. The competition marks the culmination of a three-semester project which begins in a thesis prep course, where students work with faculty to determine which architectural topic to explore, and continues during a research course where students further investigate the topic and begin work with their advisors. In the final semester, fifth-year architecture students take part in a studio, where they combine their research and architectural skills to offer a new perspective on the topic. 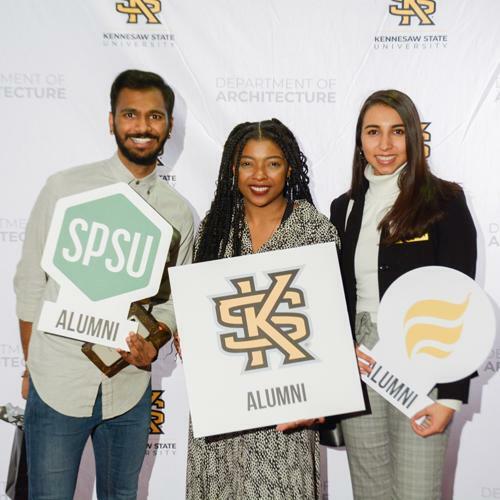 KSU’s Department of Architecture is one of only a handful of programs nationwide that requires its undergraduate students to pursue thesis projects while earning a professional architecture degree. 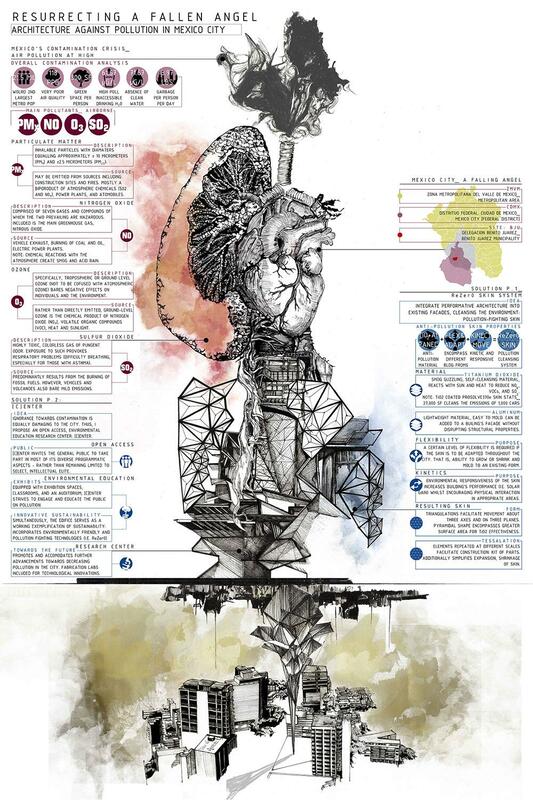 Patel’s thesis, titled “Kolkata: Ecological Urbanism Strategies for Bridging Social Gap,” focused on using design to improve social cohesion and reform the urban ecology of Kolkata, a city in East India. Tate, who also placed first in the Cooper Carry Three Minute Thesis Competition, chose to tackle America’s high prison population by designing a facility that could help prisoners more easily reintegrate with society and limit the rate of recidivism in his work, “The Anti-Panopticon." Bowen presented his project, “Skater Conscious,” in which he researched how designers cultivate social and artistic expression among skateboarders. He argues that people are able to take otherwise mundane environments and experience them in a unique way through skating. Bowen also received the Faculty Choice Award following the competition. 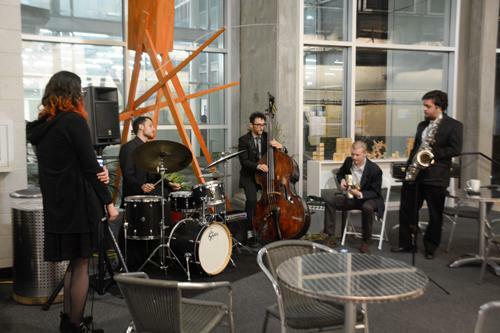 Architecture students Jesse Halverson, Andrew Newman and Karen Rios were among the finalists invited to compete in this year’s event. 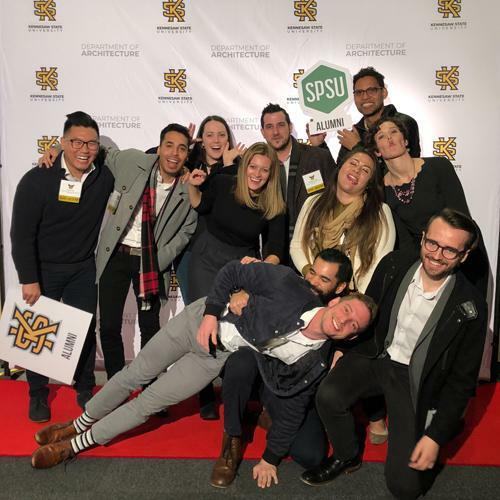 Halverson received the People’s Choice Award and Rios was nominated to represent the University in Archiprix International, a biennial competition bringing together some of the best graduation projects worldwide. Rios also presented her work at CriticalMass, an event hosted each year by the University of North Carolina at Charlotte’s College of Arts and Architecture. 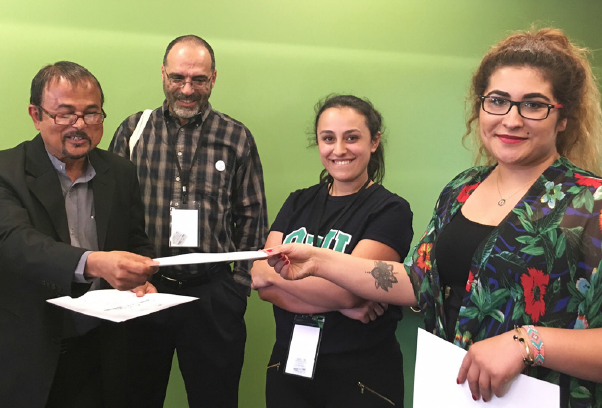 Congratulations to 5th-year thesis student, Karen Rios, for presenting her project entitled "RESURRECTING A FALLEN ANGEL: Architecture Against Pollution in Mexico City" at UNCC's CriticalMass 2019. Karen's project was selected to represent KSU during this year's CritMass. CriticalMASS fosters the tradition of collaboration and exploration across schools of architecture. Each project presented responds to a unifying theme but explores architectural ideas and issues through urban design, technical methods and theory. Karen, along with her thesis advisor Dr. Arash Soleimani, had a chance to present in front of distinguished critics such as Charles Renfro of Diller Scofidio Renfro (DSR). 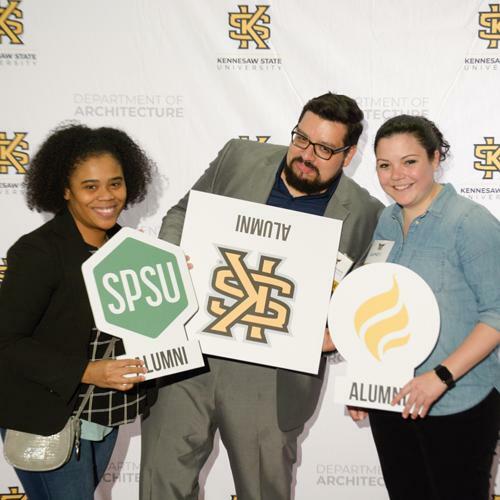 The Kennesaw State University Department of Architecture held their annual Firm Networking Event and Alumni Reception on Wednesday, March 6, 2019. Dr. Margaret Fletcher, author of "Constructing the Persuasive Portfolio" gave a lecture and conducted portfolio workshops, working one on one with fourteen students, to mark up their portfolios and discuss how they could be improved. Fifteen firms participated in the Firm Networking Event and attendance increased 25% from 2018. 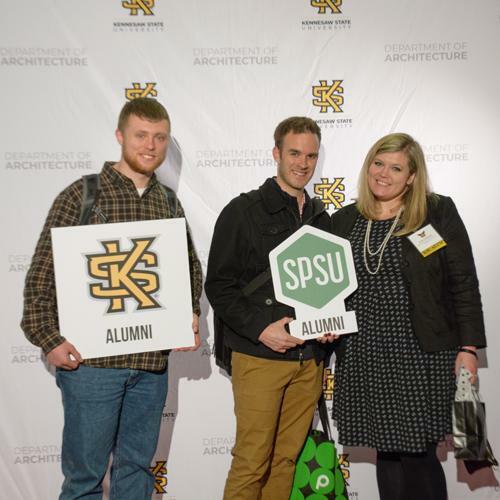 The first annual Alumni Reception was highly successful with 81 Southern Tech, SPSU and KSU alumni in attendance. The department looks forward to hosting these events again next year. Each year, thousands of undergraduates from all over the United States participate in the National Conference on Undergraduate Research (NCUR). NCUR, the largest conference dedicated to undergraduate research in the country, features work from some of the nation’s best and brightest students. Kennesaw State will serve as the host institution for NCUR 2019 April 11-13. Darral Tate of Acworth is one of more than 400 KSU students who will present his research at NCUR. Darral Tate, a fifth-year architecture student, has spent the past year researching how architecture can be used to solve America’s rising prison population. Tate’s thesis, “The Anti-Panopticon,” suggests designing a facility that could help prisoners more easily reintegrate with society and limit the rate of recidivism. His research challenges Jeremy Bentham’s 18th century design known as the Panopticon, a structure designed to allow prison guards to keep watch on nearly all prisoners from a single vantage point. Rather than encourage constant surveillance, Tate has studied how prisons could be designed in a way to allow more space that could increase learning among prisoners to better prepare them for life on the outside. 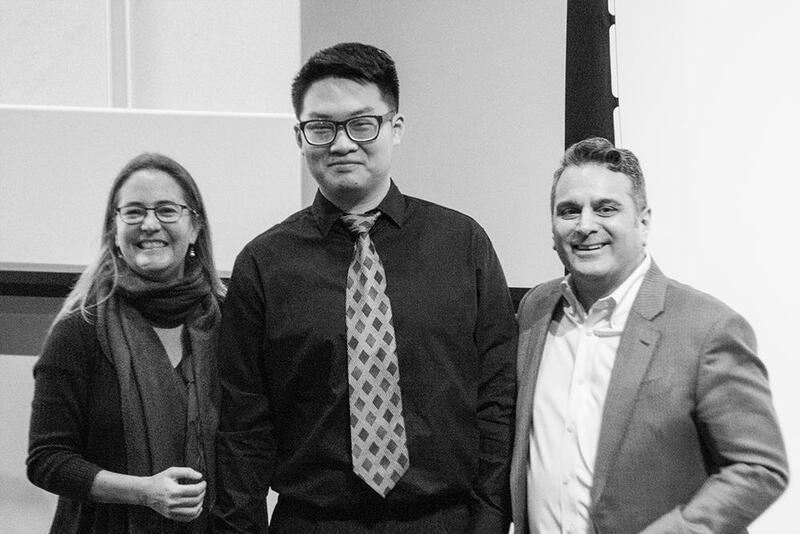 In January, Tate was named co-winner of the Department of Architecture’s annual Cooper Carry Three Minute Thesis Competition, held each year to showcase the presentation and design capabilities of fifth-year architecture students. He will be attending his first NCUR this April. Many states describe the purpose of their prisons as facilities that “protect the public while reducing recidivism.” However, the rising rates of repeat incarceration throughout the U.S. prove this system is not working. My thesis seeks to define and explain how architectural design can be used to address the shortcomings of our prison facilities. With technology, we are no longer bound to the antiquated model of the Panopticon and direct surveillance. Architects have the capability and resources to prioritize restorative spaces that are beneficial to reintegrating someone into a healthy and normal life. My thesis argues for a new prison typology that will prioritize user-based experiential perspectives that contribute to the health and enrichment of the individual. In the Department of Architecture, we work with one professor for the entire year during our thesis. It’s really important that you chose a professor that shares your excitement for the topic. Ed Akins, associate professor of architecture, has inspired me to produce work that I can be proud of. With Kennesaw State hosting NCUR, my advisors and I felt that this would be another excellent opportunity to refine my ideas and make them clearer to a broader audience. Ed Akins, my primary thesis advisor, and our thesis coordinator, Liz Martin-Malikian, associate professor of architecture, have encouraged me to develop clear and concise research that would be valid for the NCUR conference. Every week we meet to strengthen my research and design processes, so that I will reach a successful outcome. What do you hope to gain from your experience with NCUR? Preparing for NCUR has helped me to focus my ideas and clearly communicate them to others who may not be familiar with the complexity and breadth of architectural education. In fact, developing the abstract for NCUR was one of the many tasks that helped me to tie for first place in the KSU Architecture Cooper Carry Three Minute Thesis Competition this year. What advice would you give others about doing undergraduate research or participating in NCUR? Sometimes picking a topic for undergraduate research can be difficult, but it helps if you are doing something you are truly passionate about. If you are beginning your research and do not know exactly what to focus on, start with the things that interest you the most, things you may do in your free time and try connecting them back to your area of study. If you can successfully do that, no part of your research will ever seem daunting. Kennesaw State University professor Liz Martin-Malikian has been awarded the 2018-2019 Practice and Leadership Award for demonstrating highly effective teaching, scholarship and outreach in the areas of professional practice and leadership. The award, given by the American Institute of Architects (AIA) and the Association of Collegiate Schools of Architecture (ACSA), recognizes “excellence in architecture education as demonstrated in classroom, studio and community work, or in courses offered in various educational settings.” Martin-Malikian, an associate professor of architecture and thesis coordinator in Kennesaw State’s Department of Architecture, was selected by a panel composed of two practicing architects and two academic scholars. She will receive the award at the ACSA annual meeting in Pittsburgh on March 29. Martin-Malikian joined the former Southern Polytechnic State University, now KSU, in August 2006 and has since become an integral part of the architecture department’s thesis advanced core sequence. The department is unique in that it is one of only a handful nationwide programs requiring its students to pursue thesis projects while earning a professional architecture degree. In addition to her involvement on thesis projects, she teaches courses on environmental technology, materials and methods, third year studios and urban design. Prior to arriving at KSU, Martin-Malikian served as the Paul Rudolph Visiting Professor of Practice in Auburn University’s School of Architecture, Planning and Landscape Architecture. She has an extensive background in practice spanning nearly three decades. Prior to joining academia, she worked as a project manager and senior designer for The Jerde Partnership, a global architecture firm, where her design work included Taipei, Taiwan’s multi-use development Core Pacific City. Martin-Malikian also contributed to monthly urban review and design workshops with local Taiwanese government officials and architects, resulting in a 12-year urban plan. She was the project designer for the Fremont Street Experience in Las Vegas and in 2006 was the recipient of the AIA/YAF Emerging Voices Award. Martin-Malikian holds a master’s degree in architecture from the Southern California Institute of Architecture and a bachelor’s degree in architecture from Tulane University. 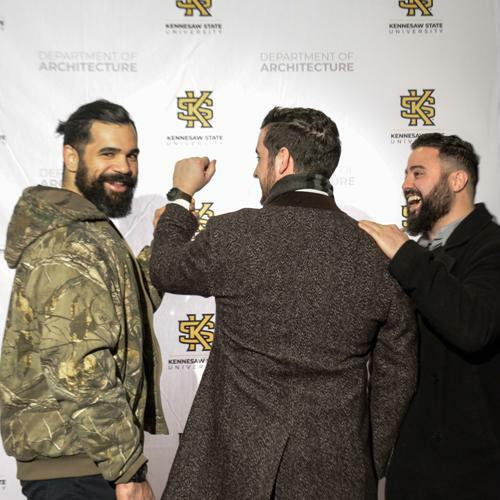 The Kennesaw State University Department of Architecture is thrilled to congratulate Professors Arash Soleimani and Liz Martin-Malikian on their recent honors and awards. Prof. Soleimani's article "CyberPLAYce—A tangible, interactive learning tool fostering children’s computational thinking through storytelling" was recently published in the International Journal of Child-Computer Interaction. You can read his abstract here. Prof. Martin-Malikian was announced as the winner of the AIA/ACSA (American Institute of Architects / Association of Collegiate Schools of Architecture) prestigious “Practice and (+) Leadership Award.” More information on the award can be found here. Martin-Malikian has also been nominated to attend former US Vice President and Nobel Laureate Al Gore’s Climate Leadership Training in March in Atlanta. 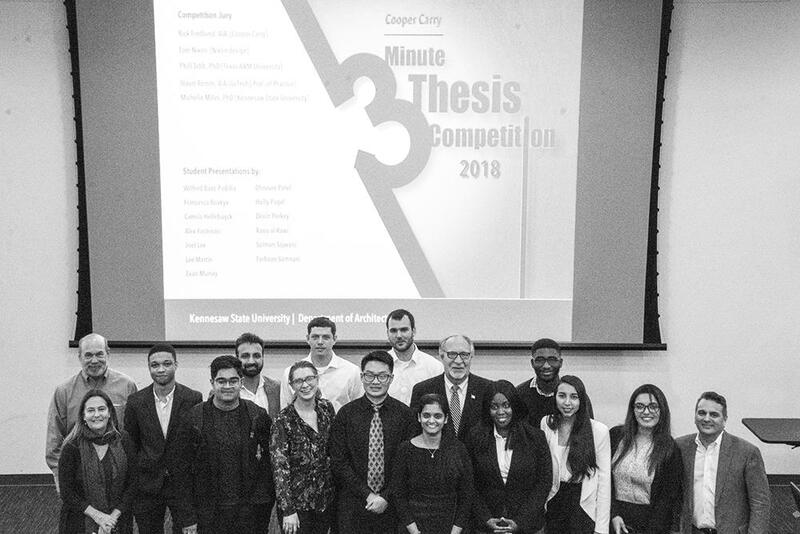 Kennesaw State architecture students competed in the annual Cooper Carry Three Minute Thesis Competition on Jan. 11, which showcases the abilities of fifth-year architecture students. The Cooper Carry Three Minute Thesis Competition was created by the University of Queensland in Brisbane, Australia, for graduate students. During the competition, the selected individuals present their work using a single PowerPoint slide in a three-minute presentation. Students are then judged by industry experts on communication style, comprehension and engagement. KSU’s ten participants were selected from fellow students after presenting their work before a panel of jurors. For the first time in the history of the competition, two winners were selected for first place and subsequently split the $3,000 cash prize. 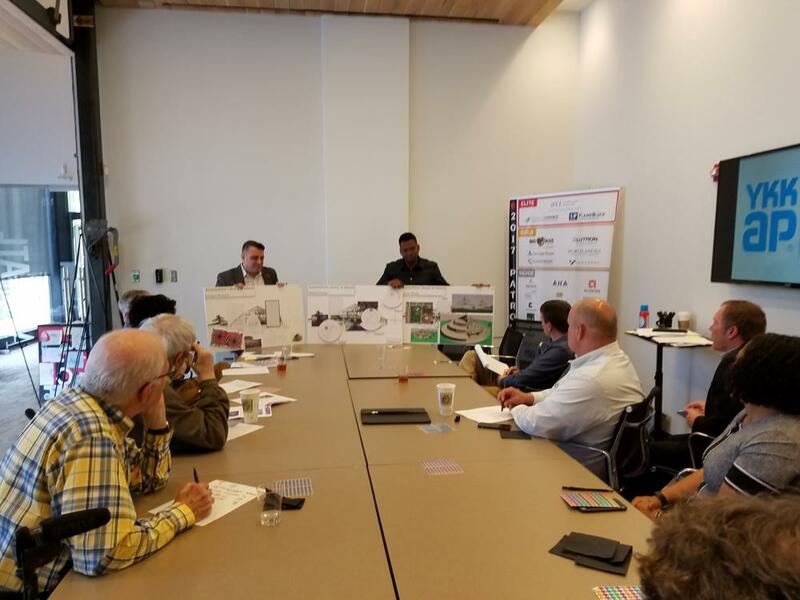 Josh Robinson and Darral Tate were chosen as the two first-place winners by a panel of jurors consisting of industry professionals, experts and alumni. Tate also received a $500 award for receiving the People’s Choice Award. A third award was given to Dyesha Holmes, who received the Architectural Research Center’s Consortium King Medal. Competitors began preparation for the Three Minute Thesis Competition in their fourth year of study through a thesis prep course. All three winners highlighted the fall semester as a vital one in that they were challenged in finding a topic that they felt passionately about and that had real-life application and contribution. Tate commented on the benefit of having a strong mentor in this stage, as all competitors work with a professor throughout the year-long process of completing their thesis. Tate commended his mentor for “really encouraging and [believing] in the work that [he is] doing.” Tate’s mentor helped him find a way to relate a deep passion relating to the issue of mass incarceration to architecture with his thesis topic of “The Anti-Panopticon” and challenging Jeremy Bentham’s 18th-century design. Several competitors commented on their inexperience and general aversion to public speaking before the competition and preparation process, but said that participating in the Three Minute Thesis Competition gave them a newfound sense of confidence and strengthened their communication skills, especially their skills pertaining to public speaking. Holmes presented her thesis, “Reframing Urban Redevelopment via Women Empowerment: Sustaining Existing Community in the West End” and focused more on her main ideas and topic than memorizing a particular script. In doing so, Holmes found that speaking about something she was exceptionally passionate about gave her a greater sense of confidence in the delivery of these ideas. The winners of the cash awards plan to use it to further their research and to see the real-life applications of their studies in architecture and design. 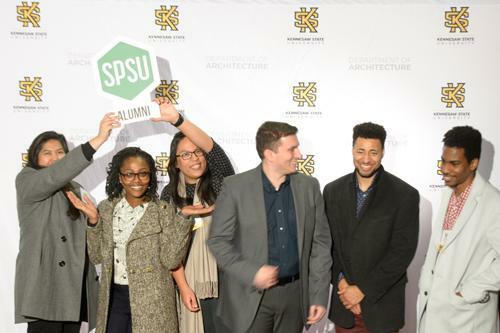 Ten undergraduate students squared off last week in Kennesaw State University’s Cooper Carry Three Minute Thesis Competition, held each year to showcase the presentation and design capabilities of fifth-year architecture students. The competition, which follows the format of the University of Queensland’s Three Minute Thesis competition, challenges students to deliver a convincing pitch for their thesis project in a short timeframe using only a single PowerPoint slide. 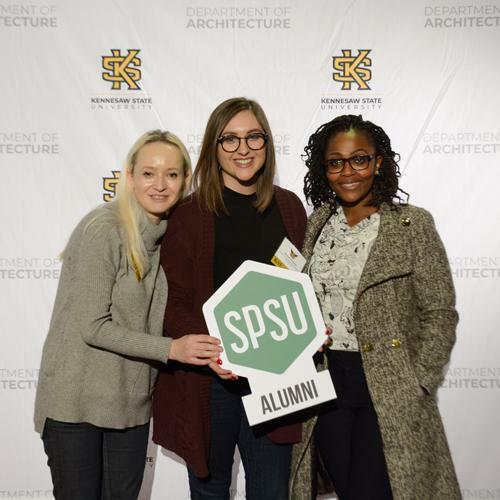 The event hosted by Kennesaw State’s Department of Architecture is unique in that all participants are undergraduate students, as the University is one of only a handful nationwide programs that requires its students to pursue thesis projects while earning a professional architecture degree. KSU’s Graduate College also hosts a separate Three Minute Thesis competition for master’s and doctoral students. In order to qualify for the competition, students begin presenting their proposals as fourth-year architecture students in a thesis prep course. This fall, 44 fifth-year students participated in an additional round, and 10 were short-listed for the Cooper Carry final round. 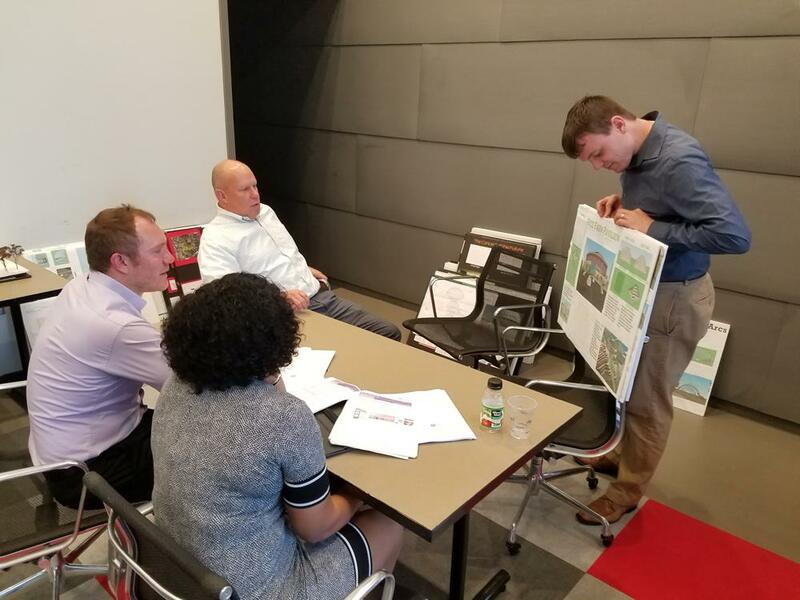 Prior to the event, the finalists take part in a three-hour training session with three professional presentation coaches, a practice that sponsor and jury chair Richard Fredlund said equips the students with an invaluable skill they will need as architects. Robinson presented his thesis “Healing the Healthcare Continuum,” which examines how to fix the public’s negative views on hospitals by designing a new, decentralized network of healthcare centers. He argued that many are deterred from seeking care at hospitals because the structures, often large and uninviting, don’t allow potential patients to directly seek the kind of care they needed. By spreading special clinics throughout the community, he said, people could begin to see healthcare centers as an integral part of their neighborhood. For Tate’s thesis, “The Anti-Panopticon,” he chose to tackle America’s high prison population by designing a facility that could help prisoners more easily reintegrate with society and limit the rate of recidivism. He chose to challenge Jeremy Bentham’s 18th century design known as the Panopticon, a structure designed to allow prison guards to keep watch on nearly all prisoners from a single vantage point. Rather than encourage constant surveillance, Tate suggested that prisons could be designed in a way to allow more space that could increase learning among prisoners to better prepare them for life on the outside. 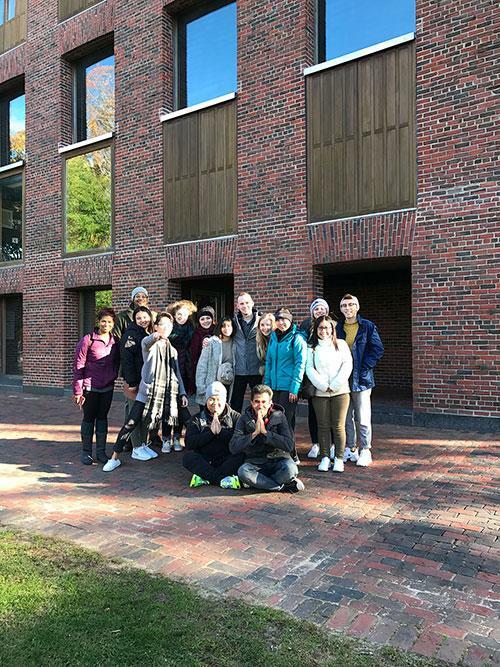 Sixteen architecture students and two former students visited the Boston area October 25 - 28, 2018 for ArchiTour Fall 2018. 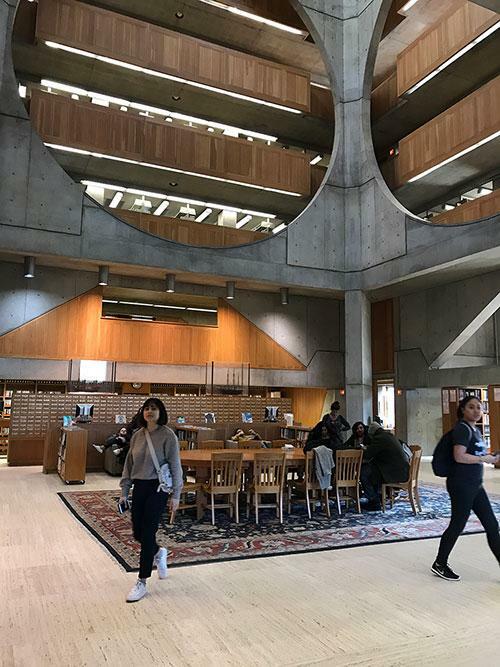 They visited notable work from great architects, past and present, in Boston, New Haven and Exeter. These included work by Le Corbusier, Louis Kahn, Eero Saarinen, Steven Holl, Alvar Aalto, and Frank Gehry, among others. Students also had an opportunity to meet one of our alumni, Blake Jackson, who generously invited them for an office tour at Stantec. Kennesaw State University's Department of Architecture, AIA Georgia, Art Papers, Architecture & Design Center, Atlanta Regional Commission, Generator and MA! 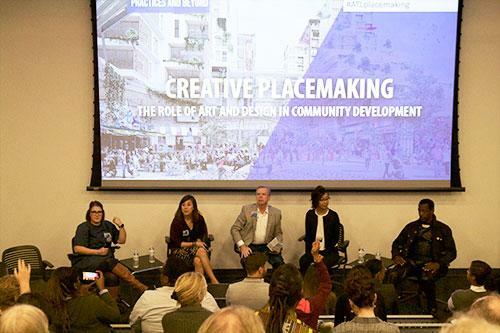 recently partnered to host the Creative Placemaking Symposium, a one-day symposium on the topic of creative placemaking. 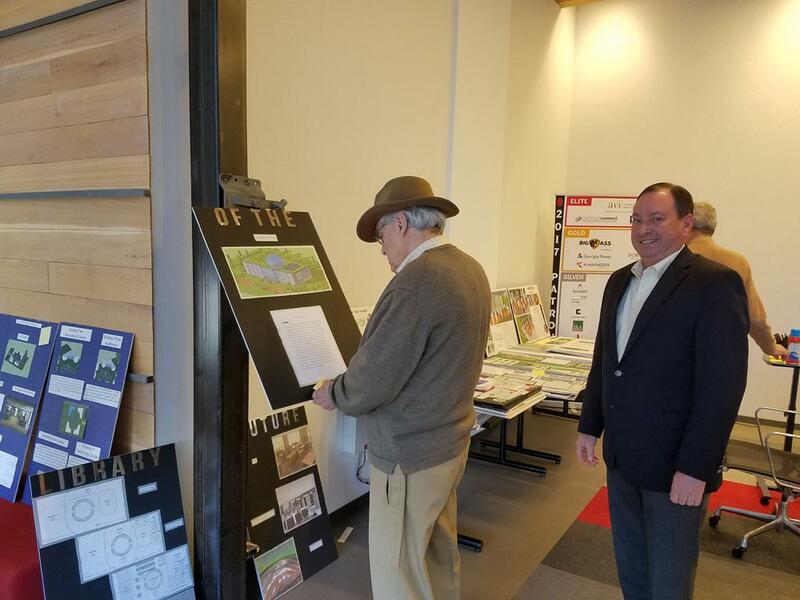 The event was held at KSU’s Architecture Department buildings on November 8, 2018. The symposium explored how integrating design and art into urban development projects from the beginning can be the catalyst for innovation. 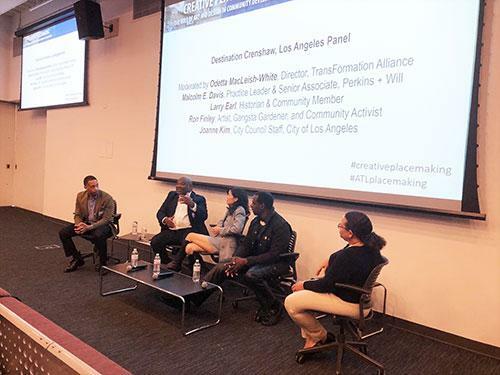 Speakers discussed their involvement in collaborative projects by multi-disciplinary teams of various governmental entities, community members, planners, artists, and designers, among others. The event was attended by academics and students of relevant fields, elected officials, policy makers, artists, arts professionals, architects and planners. 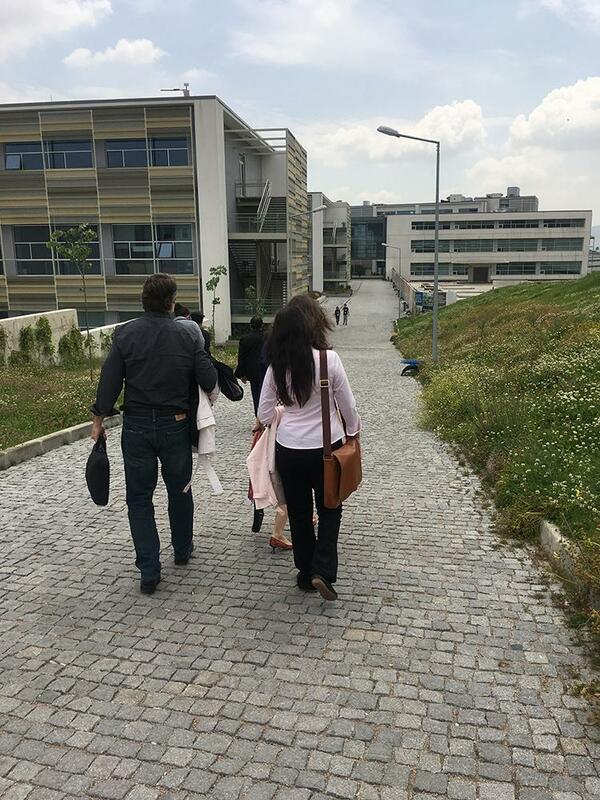 Dr. Miné Hashas-Degertekin initiated the event organization and represented the KSU Department of Architecture in the organizing team. Professor Kathryn Bedette, also of the KSU Department of Architecture, was in the organizing team as well representing AIA GA as its president. 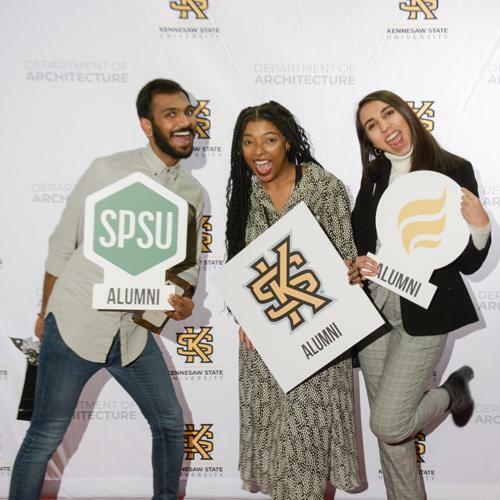 The KSU Department of Architecture would like to congratulate all of the the 2018-2019 scholarship nominees, award recipients and competition winners! We are immensely proud of all of you. In architecture, a building doesn’t have to be just four walls and a roof. Similarly, a chair doesn’t have to be four columns and a slab. At Kennesaw State University, architecture students are challenging what constitutes an urban space by creating outdoor furniture that is interactive and playful instead of drab and utilitarian. This fall, students taking the Tactical Urbanism course offered by the Department of Architecture were tasked with creating a series of so-called “urban chairs.” The chairs were designed and built by the students with the intent that they can be configured in multiple ways in order to make public spaces more appealing. The furniture, dubbed the Morphogenesis Chairs by students, includes six chairs made of birch plywood slats carefully cut on a Computer Numeric Control (CNC) machine and painted red and blue. Unlike the benches currently used along sidewalks in major cities across the county, the “urban chairs” designed by Kennesaw State students are crafted with portability and usability in mind. 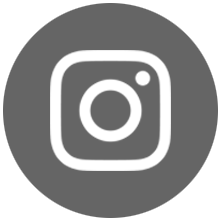 In September, Zamila Karimi, a lecturer within the College of Architecture and Construction Management, and her students took their design to Atlanta’s Lenox Mall for PARK(ing) Day, an annual global event in which car parking spaces are temporarily transformed into miniature public parks. At the event, students told passersby to use the furniture however they see fit. Some used it as a reclining beach chair and others saw it as a bench. Children saw it as a piece of playground equipment while adults sometimes saw them as flower planters. Yang, along with fellow classmate Christine Vu, presented the original concept in class. “With this design, we wanted it to have the ability to transform but still create something fun and playful,” said Vu. Throughout the Tactical Urbanism course, students are exposed to the problems urban environments are facing, such as low interpersonal interaction, and are encouraged to use their architectural skills to find creative, low-cost solutions to improve the quality of public spaces. Karimi, said the approach is particularly impactful for KSU students because it provides a channel through which they can apply their studies. The course begins by splitting the students into two groups to brainstorm ways to execute a design that fits the criteria given by Karimi. During the design development phase, models are developed at various scales to explore different aspects, such as assembly and portability. Once a fabrication strategy is agreed upon and a prototype has been tested, the class is ready to start with fabrication. Following the positive feedback at PARK(ing) Day, Karimi said her students will look for ways to introduce their temporary structures across the Kennesaw and Marietta campuses in the future, as well as seek opportunities to create permanent public structures across metro Atlanta. KSU Architecture's Associate Professor Kathryn Bedette, AIA and President of the American Institute of Architects (AIA) Georgia Chapter proposed the Diversity Pipeline and National Representation resolution to AIA leadership on June 20th at the 2018 Conference on Architecture in New York, New York. The initiative passed asserting a need for a national leadership pipeline of ethnically diverse women candidates for positions on the Institute Board of Directors and Strategic Council, this resolution called for a plan to support the Institute’s commitment to diversity and inclusion. Bedette also serves as the Architect Licensing Advisor for Georgia and was awarded the 2016 AIA Atlanta James Gant Fausett, FAIA, Service to the Profession Award. 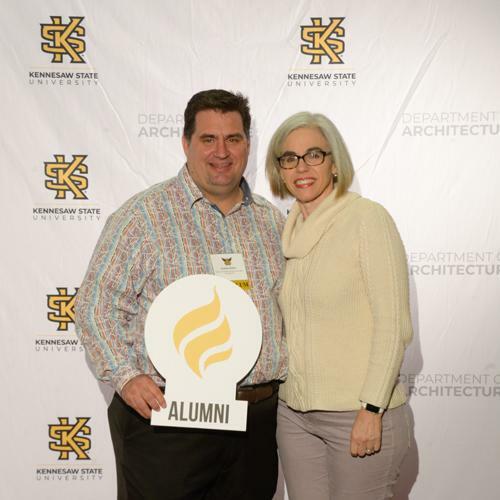 Associate Professor Chris Welty, AIA is currently the President-Elect for the AIA-Atlanta and serving as the KSU Architect Licensing Advisor for the National Council of Architectural Registration Board. Building upon his experience in practice, Welty also is the coordinator for KSU Department of Architecture’s Profession Program Sequence. His pedagogical interests center on integration of digital technologies and the art of craft focused around the notion of making. Alumna Jessika Nelson, Assoc. 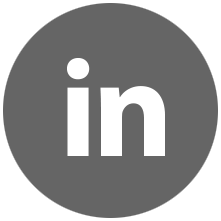 AIA is currently serving as the Programs Director for AIA Atlanta, and was previously the 2013-2014 Chapter President of American Institute of Architecture Students (AIAS). 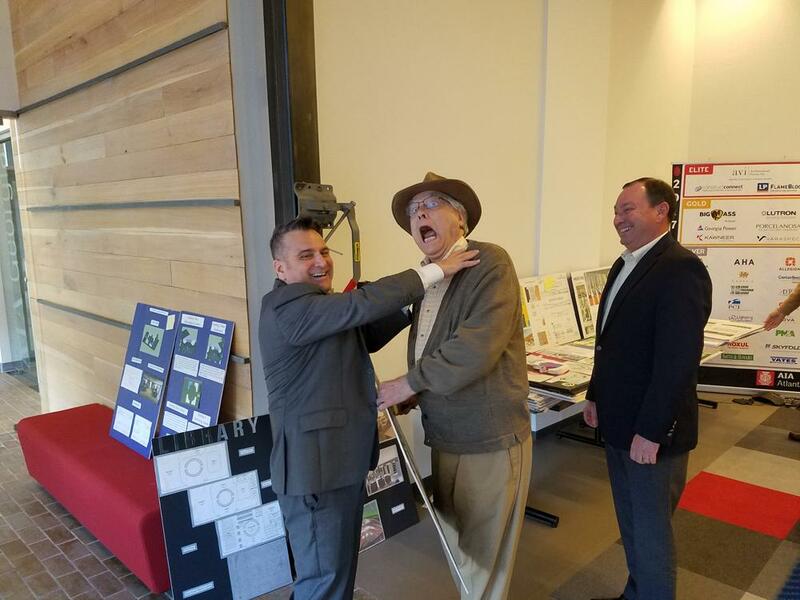 Remaining active in the department, Nelson participated as a volunteer for the Georgia Regional Future City Competition hosted by Kennesaw State University. Kennesaw State University’s Department of Architecture was well represented this fall at the Design Communication Association (DCA) 2018 Conference that was held at Cornell University from October 7 - 10, 2018. 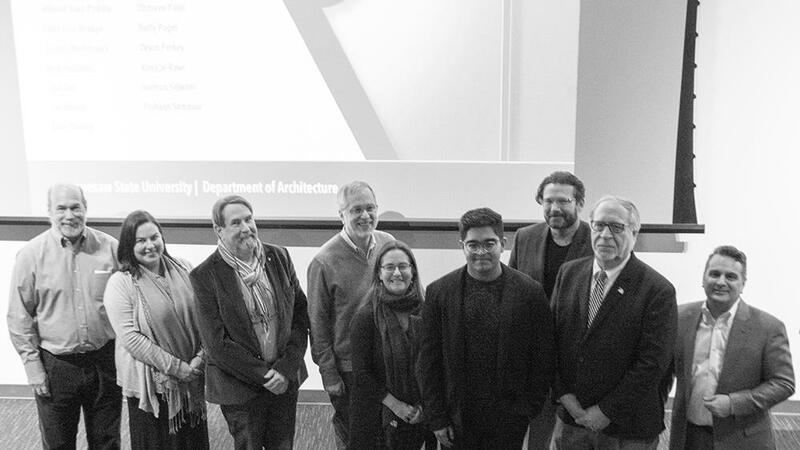 In attendance from the Department of Architecture was Professor Dr. Saleh Uddin, who co-chaired the conference, and Associate Professors: Kathryn Bedette, Chris Welty and Michael Carroll. 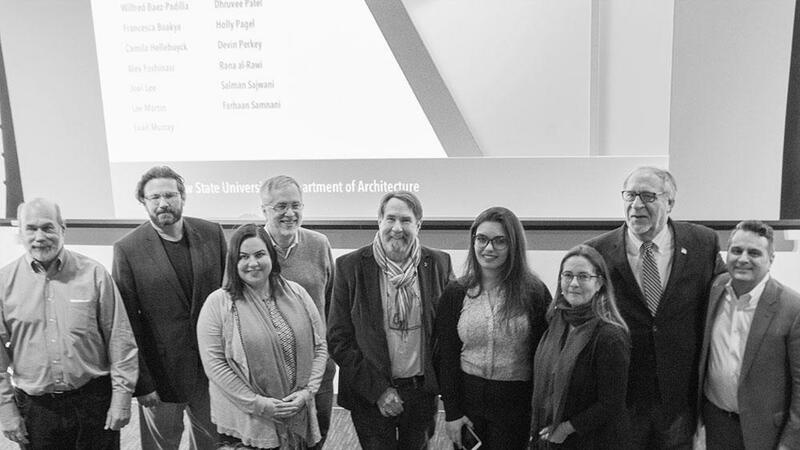 KSU's contributions to the conference ranged from paper presentations, moderation of paper sessions by KSU faculty and contributions to a curated exhibition of graphic work at Cornell’s Martha Van Rensselaer Gallery by KSU architecture students. One student submission received the Juror’s Choice Award. 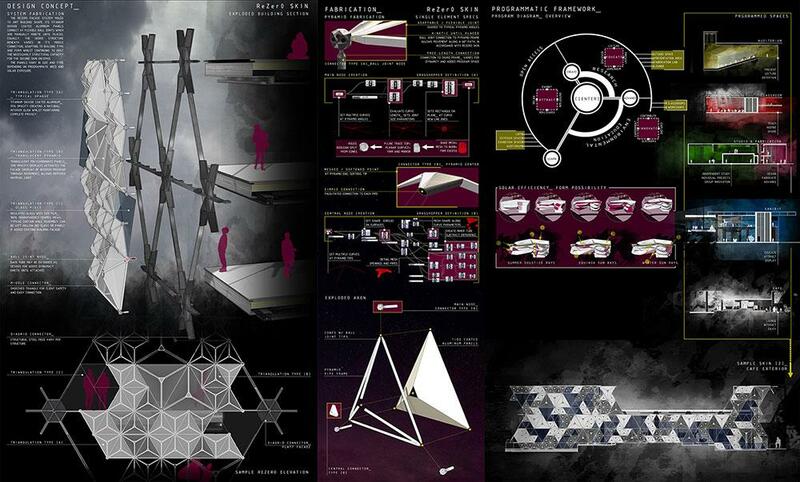 KSU Architecture student, Kathryn Stapleton, received the Juror's Choice Award in Undergraduate Design Foundation for her “Kinetic Structural System from Geometry” from Professor Saleh Uddin’s 2nd year design studio. The project highlights adaptation of transformable geometry in peacock’s feather to design a structure with kinetic expandable truss system. 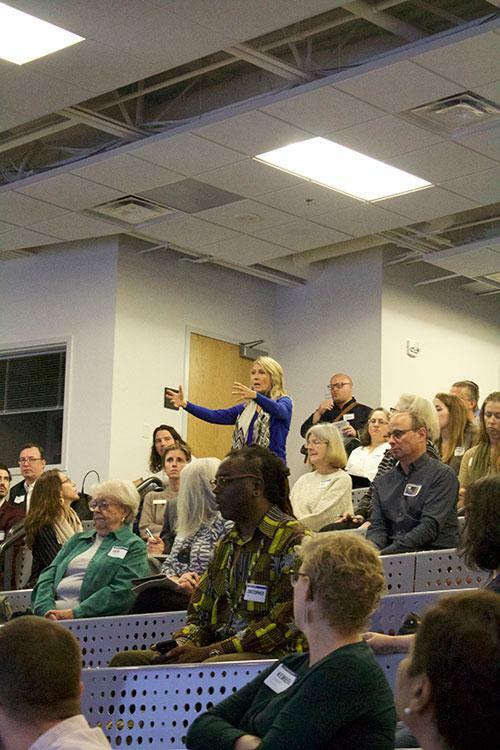 The next DCA Conference will be hosted by the KSU Department of Architecture In Fall 2020. Announcements and Call for Papers will be posted soon. 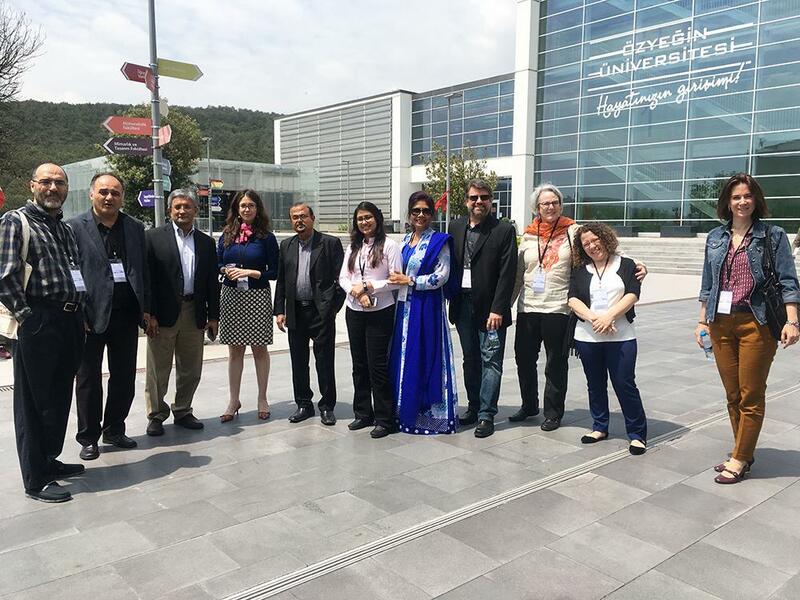 Top right: KSU Architecture professors Michael Carroll, Chris Welty, Saleh Uddin and Kathryn Bedette at The DCA Conference 2018, Cornell University. 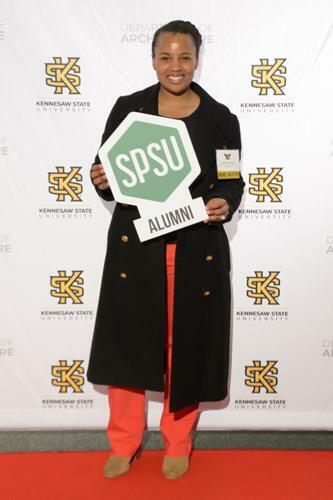 Three prominent Kennesaw State University alumni were recognized during KSU’s 27th Annual Distinguished Alumni Awards dinner, hosted by the Office of Alumni Relations and Annual Giving the evening of Friday, Oct. 5 at the Renaissance Atlanta Waverly Hotel and Convention Center. 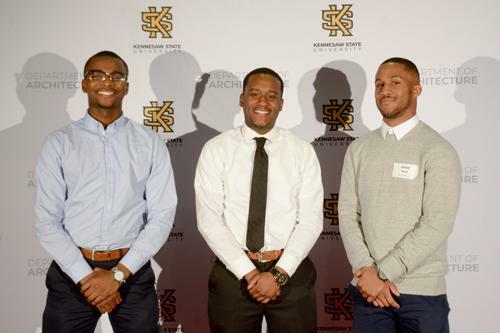 The event, sponsored by Nationwide, was held in conjunction with Kennesaw State’s 2018 Homecoming week. The Department of Architecture at Kennesaw State University welcomes Robert P. Alden, AIA, LEED AP, NCARB, who was appointed as the 2018 Focus Studio Faculty. 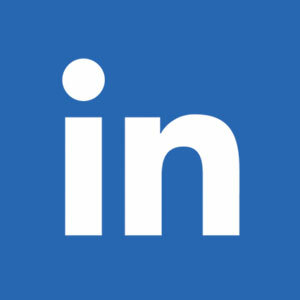 He is an architect with over thirty years of professional experience on a wide range of project types and scales -- including Georgia World Congress Center, 2002 Perimeter Summit Office Tower, the Reno Nv. Events Center, and 12th & Midtown, a 2.4M square foot, $270M mixed-used development in Atlanta. He has also taught at Chattahoochee Technical College in Woodstock, GA in the interior design program. Rob brings real-world insight to his 2018 Focus Studio entitled: Comprehensive Design and Systems Integration. The Department also welcomes Soleen Karimas the 2018 Focus Studio Faculty. She currently works at Mack Scogin and Merrill Elam Architects as a Project Manager; her project experience ranges from a single family, high-end residential, to civic buildings, urban design and architectural installations, most notably the US Pavilion in Detroit presented at the 2016 Venice Biennale. Soleen graduated from Georgia Tech with Bachelors of Architecture, Masters of Architecture and Masters of City and Regional Planning. Born in a refugee camp in Iran, Soleen combines her passion for social justice with her eye for design through her non-profit, Design4Refugees, Corp., an organization who aids refugees within camps. Soleen’s 2018 Focus Studio is entitled: Childhood Warscape. Visit the Focus Studio webpage. 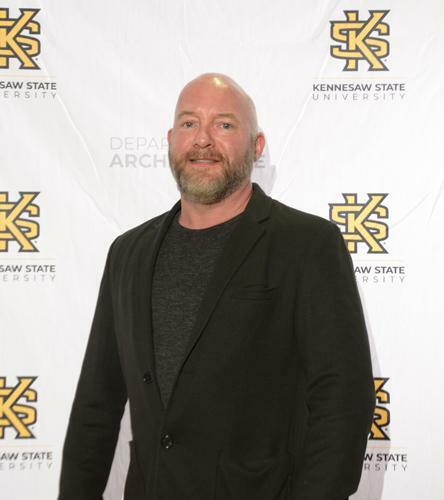 Jeffrey Collins joins Kennesaw State University this fall 2018 as an Assistant Professor in a tenure track position. 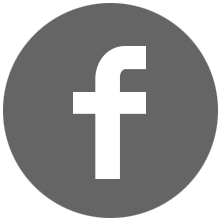 Jeffery is a Registered Architect and architectural educator. He obtained his bachelors and masters degrees in architecture from The Ohio State University and is currently pursuing a doctorate in architecture, with concentration in design computation, from the Georgia Institute of Technology. Since 2009, he has taught architecture studio and lecture courses at Georgia Tech, Southern Polytechnic State University, Auburn University, and Kennesaw State University. In 2018, AIA Atlanta and the Young Architects Forum named Jeffrey as their Emerging Voices honoree. 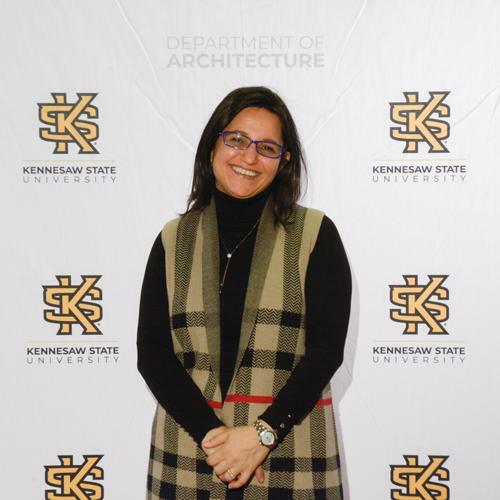 The Department of Architecture at Kennesaw State University also welcomes Dr. Selen Okcu (PhD 2011, Georgia Institute of Technology), who was appointed a fulltime Lecturer. As a former Research Scientist at NASA and a Design Educator, she has published widely on a variety of emerging architectural topics including culture, perception, and technology. She is the recipient of the King Medal from the Architectural Research Centers Consortium (ARCC) and the Newman Medal from the Acoustical Society of America (ASA). KSU Architecture's Kathryn Bedette, President of the American Institute of Architects (AIA) Georgia Chapter, proposed the Diversity Pipeline and National Representation resolution to AIA leadership on June 20th at the 2018 Conference on Architecture in New York, New York. The KSU Department of Architecture is proud to announce that Professor Tim Frank was awarded Best Paper at the 2018 ARCC-EAAE International Conference held in Philadelphia May 16th - 19th. The Charnley-Norwood House, situated along the Mississippi Gulf Coast, is a lesser-known vacation bungalow drawn by Frank Lloyd Wright as an experiment while working under his “Lieber Meister”, Louis Sullivan. Built in the latter part of the 19th century, it exemplifies a turning point in American architecture as the groundwork for Wright’s signature Prairie Style was taking root. Embedded within this structure are fundamentals about an organic approach to architecture, clearly demonstrated by the assimilation of the building into the interworkings of both site and climate. Sullivan and Wright scholars both agree that this house, undocumented to‐date, serves as a significant milestone in the history of American environmental design. What is unknown about the house is how the dictates of the coastal gulf climate influenced its spatial disposition and how this composition grew out of well‐established traditions of environmental design. The T‐shaped bungalow encompasses many distinctive features including its overall horizontality, an overarching parasol roof plane, a permeable building exterior and intermediary space types along its perimeter. The open plan organization follows its predecessors in its thinness with rooms dispersed along each axis, creating multiple exposures that alter the orientation of interior spaces to year‐round climatic effects. Operating in concert, these attributes serve to admit prevailing breezes, extend views to the surrounding landscape, and shade inhabitable areas; hallmarks that would alter the course of 20th century residential architecture in America. Using computational simulation tools, this paper discloses how the bungalow advances strategies of passive design utilized by early 19h century predecessors and paves the way toward an environmentally integrated 20th century period of residential construction. Additionally, this paper offers insight into a formative moment in architectural history when two American masters were in direct collaboration. There were over 90 accepted papers at this conference, which had a blind-peer review acceptance rate of 37%. 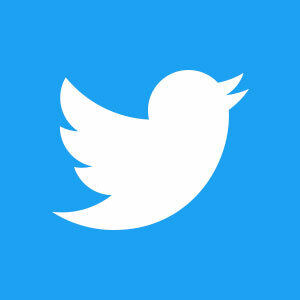 The conference theme centered on happiness with the aim to advance the discourse on explicit connections between design decisions, qualities of life, and the promotion of community. The idea of Gross National Happiness (GNH) speaks to a measure of the collective well-being of a nation. Introduced by the King of Bhutan in early 1970s as an alternative to the prevalent notion of Gross National Product (GNP), the revised concept focuses on human life and identifies four pillars of happiness as outlined in Bhutan's constitution: good governance, sustainable socioeconomic development, preservation and promotion of culture and environmental conservation. Recognizing the inherent relationship of the built environment to the tenets above, researchers revisit the framework for Gross National Happiness. The timing of this is significant as it aligns with major shifts in social and political agendas both globally and locally that impact our physical and social environment. This is an opportunity to reflect on what and why we research. The 2018 ARCC-EAAE International Conference brings together architectural scholars, researchers and practitioners from around the world, examining the architectural dimensions of community at scales between intimately local settings and the broader global commons. Philadelphia - referred to as the cradle of modern democracy - provides an opportunity to extend the conversation to consider the humanistic and environmental forward-looking gaze that is part of the spirit of the place. The KSU Department of Architecture is proud to announce that Professor Ed Akins has been selected as the recipient of the 2018 2018 Presidential Diversity Awards' R.C. Paul Excellence in Sustainability Award. Ed has served as Co-Chair and Chair on the President's Commission for Sustainability at KSU and has taught Ecological Urbanism within the USG European Council Paris program. He was chosen as KSU Sustainability Fellow for the 2016-2017 Academic year and was chosen to attend the 2017 EAO Workshop in Germany focused on the topic "Sustainability - Challenges for the World of Tomorrow. The R.C. 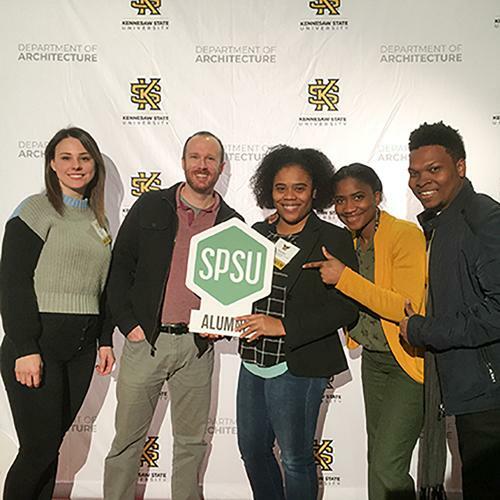 Paul Excellence in Sustainability Award recognizes the outstanding efforts of an individual toward promoting environmental sustainability in the educational and operational practices of the Kennesaw State University (KSU) campus community. Designing or coordinating campus sustainability initiatives such as green building projects, commuting alternatives, energy and water conservation measures, farm-to-campus programs, etc. Advocating for the inclusion of sustainability perspectives in campus planning and policy making. Contributing across the curriculum by promoting sustainability content in courses and academic programs throughout the university. Creating projects and events that promote greater awareness of KSU's sustainability efforts (e.g. energy and water conservation, commuting alternatives, farm-to-campus programs). Designing informal educational activities and programs to inform students, faculty, and staff about ways to foster sustainable practices at KSU and the communities it serves. 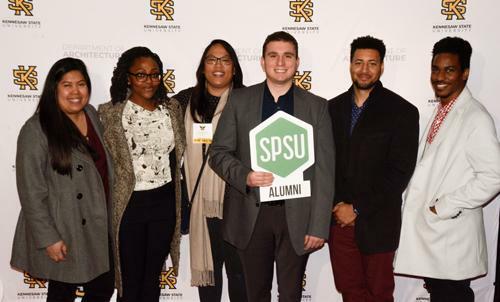 Established in 2013, and led by the six Presidential Commissions on Diversity, these awards honor faculty, staff and students of Kennesaw State University (KSU) whose actions, activities, and/or accomplishments in diversity support the pursuit of excellence towards making KSU a more inclusive and welcoming university. Annually, the six Presidential Commissions on Diversity seek nominations of individuals at KSU whose accomplishments are aligned with the charge of one (or more) of the commissions. Each commission has its own award criteria that a prospective nominee should meet. This criteria also serves as a guideline in the selection of the award recipient(s). Congratulations to the Department of Architecture's Professor Tim Frank for winning a design award for his Angier Springs Monumental Work at the 2018 AIA Georgia Design and Honor Awards. Located along the Atlanta BeltLine, this permanent structure creates a new kind of urban room for the city, offering a retreat for those traveling the promenade. Akin to a budding forest, the open field of slender pillars explores the light demarcation of public space without explicit boundaries. The structure produces a medley of effects, offering visitors numerous encounters that change with the sun, the wind and the collection of participants who pervade the space. The transforming character of the room emboldens public engagement, creating immersive and interactive zones to be discovered anew as the space constantly reinvents itself within an ever-changing context. 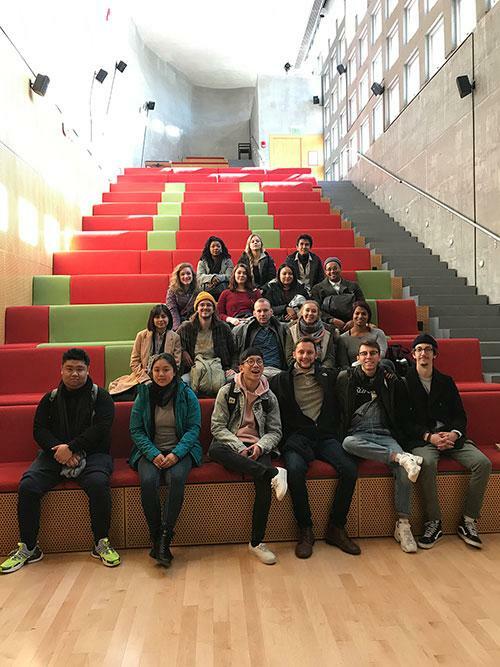 This Spring, Dr. Setiawan and fifteen students traveled to Seattle, Washington and Portland, Oregon as part of KSU Architecture's ArchiTour Program. Among the sites visited were the Seattle Public Library by Rem Koolhaas/OMA, the Olympic Sculpture Park by Weiss/Manfredi, the Bullit Center by Miller/Hull, the Ballard branch public library by Bohlin Cywinski Jackson, the Bellevue Art Museum by Steven Holl, the Museum of Pop Art by Frank Gehry, the Seattle Center, the Cultural Park (Portland) by Kengo Kuma, the chapel of St. Ignatius by Steven Holl and the Amazon Spheres. For more on the ArchiTour program, click here. 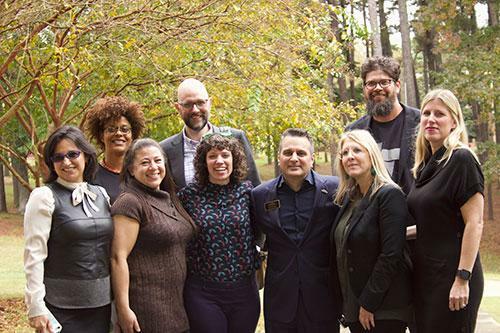 Congratulations to the Department of Architecture's Liz Martin-Malikian, Dr. Miné Hashas-Degertekin, and Michael Carroll, who have each been appointed 2018-2019 Sustainability Faculty Fellowships with the Center for Diversity Leadership and Engagement at Kennesaw State University. Liz Martin-Malikian (right) will be developing a new curriculum in Real Estate Sustainable Development as a campus-wide undergraduate minor to prepare students for careers in the corporate sector, nonprofit organizations, government agencies, or environmental advocacy groups. As proposed, this new minor would be an interdisciplinary one-year program to prepare students to become effective and influential participants in the fields of real estate, finance, design and development. The intent of this undergraduate minor is to not only help students develop a systems-level perspective of the economic, environmental and social dimensions of sustainable developments, but also raise awareness within the broader campus community. Michael Carroll’s (right) academic research focuses on materiality and material expression in contemporary architecture. As Sustainability Faculty Fellow 2018-19, Professor Carroll’s project, entitled "Performative Façades: De-constructing Identity Through Architectural Design", embraces sustainability from both a technological and a cultural perspective. The proposal centers not only cutting edge innovative materials and performative façade technologies that filter light and air, but also how these can be deployed in the design of a series of façade systems for non-profit groups in Metro Atlanta that traditionally have been under-represented. These façade systems would not only make buildings that house these groups more ecologically sustainable but also positively contribute to the cultural identities of those organizations. 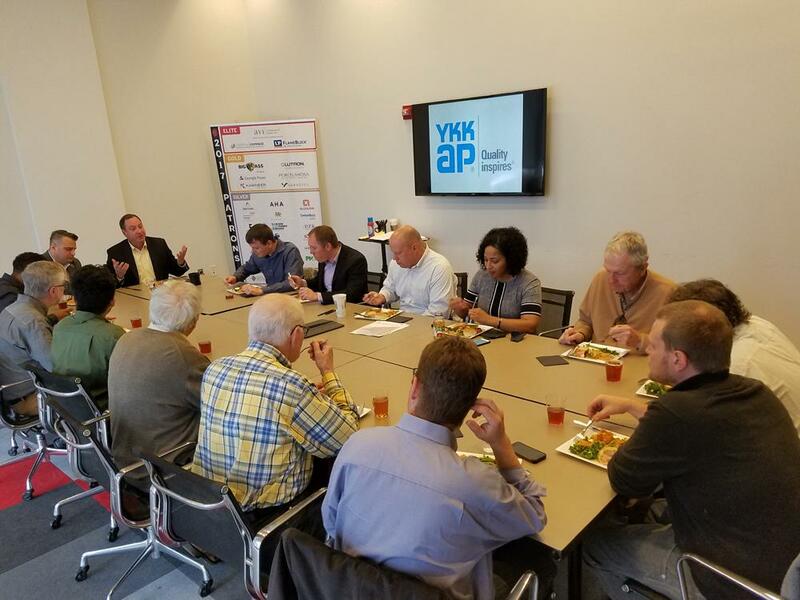 On Wednesday, March 7th, leaders from Metro Atlanta's architecture community gathered to share professional advice and information about their firms to KSU's Architecture students. Representatives from Beck Group, BRR Architecture, CBRE Heery International, CDH Partners, Cooper Carry, HOK, McAfee3 Architects, Office of Design, Pattern R&D, and Perkins + Will joined a panel discussion at the event, followed by one-on-one networking with students. Special thanks to all of our panelists and participants. 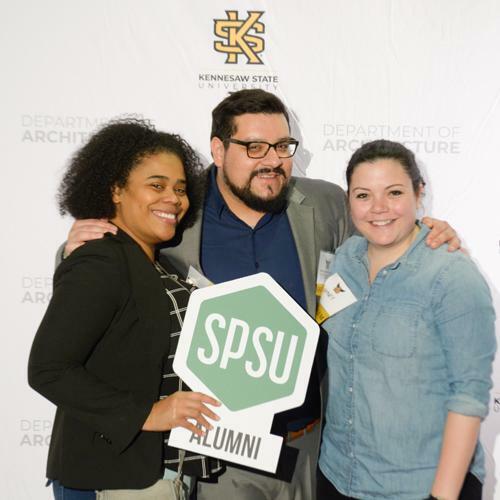 The Architecture Department at KSU fosters a meaningful and collaborative relationship with the professional practice community to enrich the education of Georgia's next generation of architects and enhance their preparedness for careers of excellence and leadership in our communities. Organized by Thesis Coordinator and Professor Liz Martin-Malikian, the 4th Annual Cooper Carry | 3-Minute Thesis took place on January 26, 2018. Thirteen students competed for cash prizes equaling $3,000. The competition jury included Rick Fredlund, AIA of Cooper Carry; Michelle Miles, PhD , Honors College at Kennesaw State University; Professor Sheb True, PhD, Coles College of Business, Tom Nixon of Nixon Design; Stuart Romm, AIA, Professor of Practice at GaTech; and Professor Emeritus Phill Tabb, PhD of Texas A&M University. Brief: In his thesis, Farhaan is looking at building more sustainability in developing countries. Brief: In her thesis, Rana began her thesis looking at her roots and how schools must be able to adapt to conflict, while being spatially integrated with the community. Brief: Joel began his thesis looking at cultural identity and his research lead him to coin the term Re-Hanok-ization. 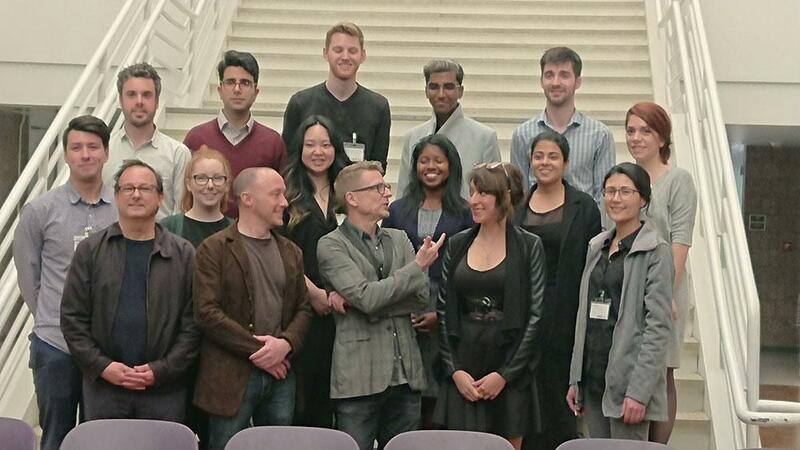 Congratulations to this year’s winner and all of the 3MT Competition participants! An asset to the design and build profession, Bedette has served as the American Institute of Architects (AIA) Georgia Advocacy Director in the past and as the Board President presently. She teaches grassroots-driven architecture advocacy in her role at Kennesaw State University and is credited with aiding the passing of the House Bill 943 Indemnification Bill. Click above image to see full article. Article begins on page 18. The architecture of any society reflects a community’s aspirations, aesthetic sense, economic well-being and level of technological advancement. More importantly, architecture helps shape the vision of society. These notions were discussed at the Kennesaw State University (KSU) lecture series on Diversity and Pluralism. 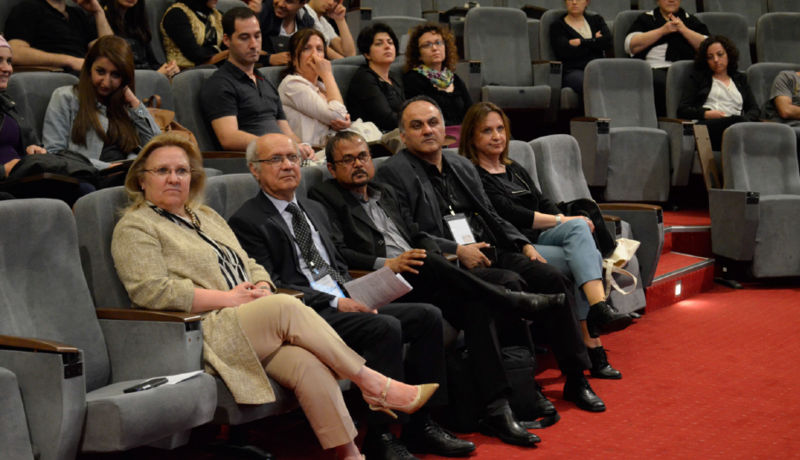 The lecture, entitled, “At the Cutting Edge: A Retro-Prospective of the Aga Khan Award for Architecture,” was recently organized by KSU, in collaboration with the Aga Khan Council for the Southeastern United States. Prof. Khan remarked Khan also that the vision of the Award was to protect the past and inspire the future; to improve quality of life; and to examine, analyze, understand and try to influence the dynamics of physical change in Muslim societies. AKAA is one of the oldest and most prominent awards in architecture. It was established by Mawlana Hazar Imam in 1977 to identify and encourage building concepts that successfully address the needs and aspirations of communities in which Muslims have a significant presence. The selection process emphasizes architecture that not only provides for people's physical, social, and economic needs, but that also stimulates and responds to their cultural and spiritual expectations. Particular attention is given to building schemes that use local resources and appropriate technology in an innovative way, and to projects likely to inspire similar efforts elsewhere. Prof. Khan added that the early-on AKAA led to discourses underlining that architecture should not be judged from “a point of view,” and that architecture could provide an answer to many issues and problems. “The Award encouraged that conversation about diversity and pluralism in architecture and that changed the discourse – that has been the biggest contribution of the AKAA,” he said, underscoring the impact that the Award has made in the realm of architecture. About 250 KSU students and graduates attended the lecture, which was followed by an exhibition that showcased the nominated projects of the 2016 Award cycle. 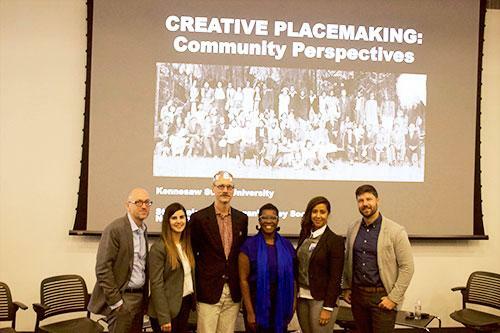 Arash Soleimani, Assistant Professor at KSU and Co-Chair of the lecture series, emphasized the need for students to know how place-making and the notion of architecture can inform the process of design. “Rather than just thinking about style and type, it is important for students to understand how architecture can bring people together in the globalized world,” he said. Originally from Iran, he also shared his experience of visiting the Tabiat Bridge, one of the 2016 AKAA winners, and how the bridge had become a place for the community to get together. “It was such an amazing experience to see people gathered at the bridge, talking and eating together, sharing ideas and celebrating their culture,” said Soleimani, while talking to students at the exhibition. Farhan Samnani, a fifth year KSU student, said that the talk answered a lot of questions and inspired him to create architecture that is more social and works on improving the lives of people as well as looking at the community as a whole. The Kennesaw State University Department of Architecture, in collaboration with the Aga Khan Council for the Southeastern United States, presents its first lecture of the series, “Diversity and Pluralism in Architecture" on Monday, October 9th at 4:30pm in the Design II Auditorium. Please join us for Professor Hasan-Uddin Kahn’s lecture “At the Cutting Edge: A Retro-Prospective of the Aga Khan Award for Architecture.” Prof. Kahn is the Distinguished Professor of Architecture & Historic Preservation at Roger Williams University. The Aga Khan Award for Architecture is not a prize, but a process of examining the built environment of Muslims and a discourse about contemporary building the world over. Looking back over the genesis and development of the Award and looking forward, the architectural discourse so engendered unfolds as a series of agendas that are illustrated by the award program. The lecture will be followed by the Aga Khan Award for Architecture Exhibit opening reception at the Architecture Gallery. For further information on the Aga Khan Award for Architecture, please visit here. Kennesaw State University alumnus William Lentjes has been named a Portz Scholar, an accolade the National Collegiate Honors Council awards to only four people in the U.S. each year. Lentjes graduated from Kennesaw State in May with a degree in architecture and as an Honors Scholar, the University’s highest academic honor. The NCHC chose Lentjes as a Portz Scholar based on his senior capstone project titled “On Craft,” which re-examines the instructional methods utilized in architectural education. Lentjes will present his project at the National Collegiate Honors Council conference in Atlanta in November. NCHC member institutions can nominate one paper written by an undergraduate honors student for the Portz Scholars competition, and Kennesaw State’s Honors Collegeselected Lentjes’ thesis – which also was awarded the 2017 KSU Outstanding Senior Capstone Award for the Marietta Campus. In “On Craft,” Lentjes promotes looking beyond “endless mechanized production and spiritless materialism” and viewing architecture “through the consciousness, awareness and perception of a subject.” He describes “craft” as a relationship between craftsman, tool and material. Anderson said she was most impressed by the level of detail Lentjes put into the project. He made his own paper on which to write the thesis, used woodworking and burnishing skills to make the cover for the project, and transposed his computational drafts and graphic designs to the handmade book. Lentjes showed “thoughtful attention to how his work on that capstone could be a benefit to the learning process for other architects,” Anderson said. Lentjes impressed potential employers as well, as he was hired upon his graduation as a designer for Office of Design, an architecture firm in Decatur. Lentjes said he is “excited to learn more each day” and plans to become a licensed architect soon. This summer, while some kids were off at camp, prepping for the fall SATs or getting through their binge lists, a group of youngsters around Cobb County were pondering how Marietta’s landmark Big Chicken could look even better. They also turned a critical eye to the Marietta Visitors Center, the Zuckerman art museum at Kennesaw State and the new SunTrust Park and Battery complex. Reimagining how structures can be built for a specific purpose and audience was the aim of the Discover Architecture: Library Edition, a program that paired Cobb public librarians with volunteers from the American Institute of Architects Atlanta chapter and representatives from the architecture department at Kennesaw State. During four one-day sessions held this summer, the teams worked with kids to introduce them to and get them enthused about architecture. Brooks got the idea to create a summer series after hearing about Discover Architecture, a successful after-school program offered in select Atlanta elementary schools. The founders of that program produced a textbook filled with details on lessons and projects that fit nicely into a one-day event. Brooks brought the idea to Youth Services Librarian Amanda Densmore, who works out of the Vinings location. Phillip Alexander-Cox, an art instructor at E. Rivers Elementary in Buckhead and a co-founder of the APS Discover Architecture program, was happy to provide resources and direction for the library program. It’s another way the concept has grown since he and architect and E. Rivers parent Melody Harclerode launched it seven years ago. Information about the Discover Architecture program at E. Rivers Elementary School: eriverselementary.com. The Dept. of Architecture partners with the Cobb County Public Library System and AIA Atlanta for "Discover Architecture: Library Edition"
Students in grades 4-8 are invited to participate in a one day Discover Architecture workshop based on the AIA's Discover Architecture Program. Students do sketching exercises and build models of their designs, working with volunteers from local architecture firms and faculty from the Department of Architecture at KSU. Dr. Tony Rizzuto, Dr. Giovanni Loretto, Dr. Arash Soleimani, Professor Bronne Dytock and Professor Marietta Monaghan and alumni Jereme Smith and Jessika Nelson joined Discover Architecture founders Melody Harclerode and Phillip Alexander Cox at the Switzer, West Cobb, Mountain View and South Cobb library branches. 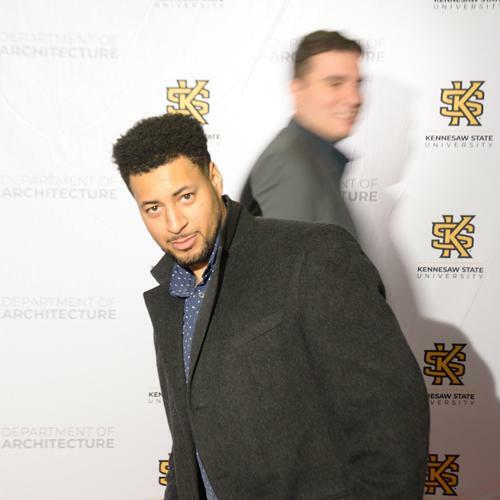 KSU Architecture student, Jalaal Malik, has been chosen as the recipient of the Atlanta Center for Creative Inquiry's scholarship to attend the Harvard University Graduate School of Design's six-week summer Career Discovery program from June 19th through July 28th. Every year, the Atlanta Center for Creative Inquiry (ACCI) sends a deserving young student who is deeply interested in Architecture to this wonderful program. Others have said that the program has had an enormous impact on their careers both in college and afterward in their profession. We are so proud of you Jalaal, and can't wait to hear about your experience! More about the program: designdiscovery.gsd.harvard.edu. 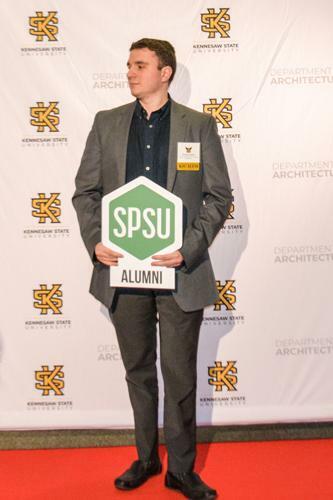 The Department of Architecture would like to congratulate William Lentjes for being awarded the 2017 KSU Outstanding Senior Capstone Award for the Marietta Campus. William was selected for the award for his Bachelor of Architecture Thesis "On Craft", Thesis Advisor: Kathryn Bedette. In an age of endless mechanized production and spiritless materialism, the practice of craft can teach us to return to the experience of Being. The KSU Department of Architecture would like to congratulate all of the the 2017-2018 scholarship recipients! We are immensely proud of all of you. With a passion for the intersection between architecture and health, Matt Finn (Architecture, ’07) is working to understand how design affects people. “As an architect, I need to understand how the spaces I design affect people who use them,” said Finn, who gained his start studying how the built environment could facilitate psychotherapy for U.S. combat veterans with post-traumatic stress disorder (PTSD). Partnering with a Veteran Affairs psychologist and a Marine Corps veteran, Finn first began the PTSD research while at Perkins+Will, the design firm he joined after completing his bachelor’s degree in 2007. “Architecture’s role is to facilitate the activities within,” Finn said. Finn is currently collaborating with the National Collaborative on Childhood Obesity Research and the Centers for Disease Control and Prevention to understand how design can influence childhood obesity in America, and with the Green Health Partnership on ways the built environment can influence issues of public health. Healthcare Design recently named Finn the 2016 HCD 10 Researcher, making him one of the first practicing architects to receive this distinction. One of the projects noted by the magazine was Finn’s consultation on the design of ICU patient rooms for the University of Virginia Health System. Finn and his transdisciplinary research team’s findings were featured at the 2014 Academy of Neuroscience for Architecture Conference and the 2015 American Institute of Architects Convention. 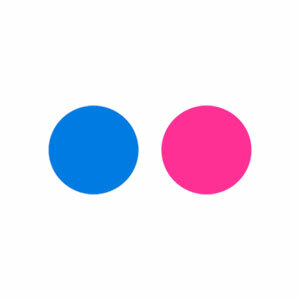 In 2014, Finn founded his own consulting and design firm, Cognitive Design, LLC. In 2016, he left Perkins+Will to pursue his own practice full time. 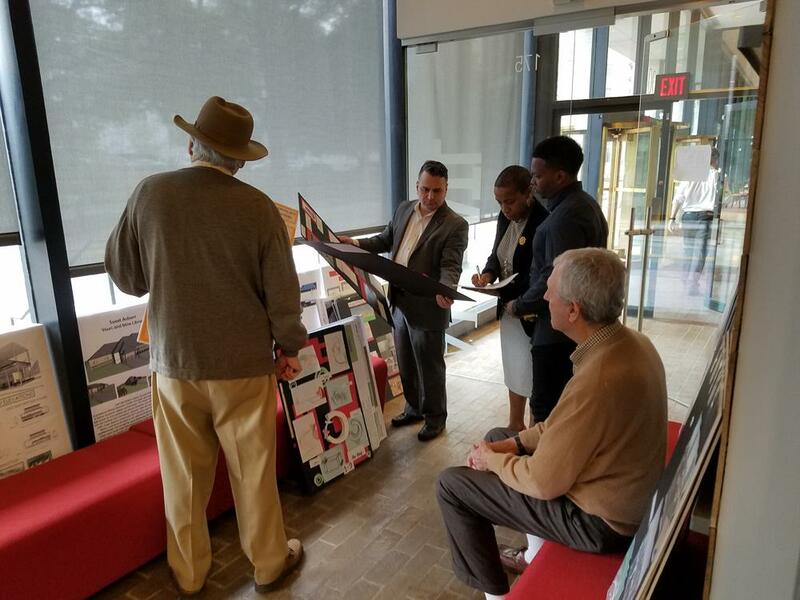 Last week, KSUarch Chair, Dr. Tony Rizzuto, served as a juror for AIA Atlanta's (American Institute of Architects) 12th Annual High School Student Design Competition. 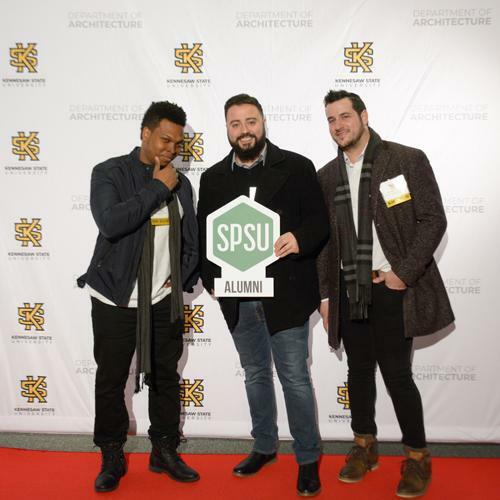 Also serving as jurors were current KSUarch first year student, Neil Isaiah Requina Capangpangan, who won the competition last year, alumni Jereme Smith and Adam Lamb and part-time faculty, John Busby. Jurors have selected winners for two projects, a pavilion and a library. The winners will be announced at an awards ceremony on Tuesday, April 11th at the College of Design at Georgia Tech. 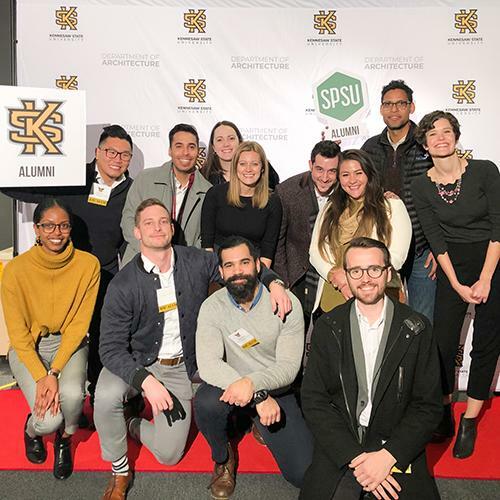 The department has just nominated thesis student, Brandon Aultman, to represent Kennesaw State University at the CriticalMASS Symposium Competition at the University of North Carolina at Charlotte. Aultman will be traveling there next week and will present his thesis "Scalar Resiliency in the Age of Disruption", making this the first time in KSU history to participate in the competition. CriticalMass started in 2002. It was the idea of a handful of thesis students wishing to share thesis project work with other schools of architecture from the Southeast Region. At that time, the students were interested in the idea of place and region, and the event sought to bring diverse projects from different institutions together so that the students could share, and perhaps understand, what commonalities might be present in their final project work. The students themselves identified and invited international and national architects and critics to discuss the work and to give an evening presentation. These critics have varied over the past ten years, from those interested in regionalism to those that were launching practices on a more global scale. 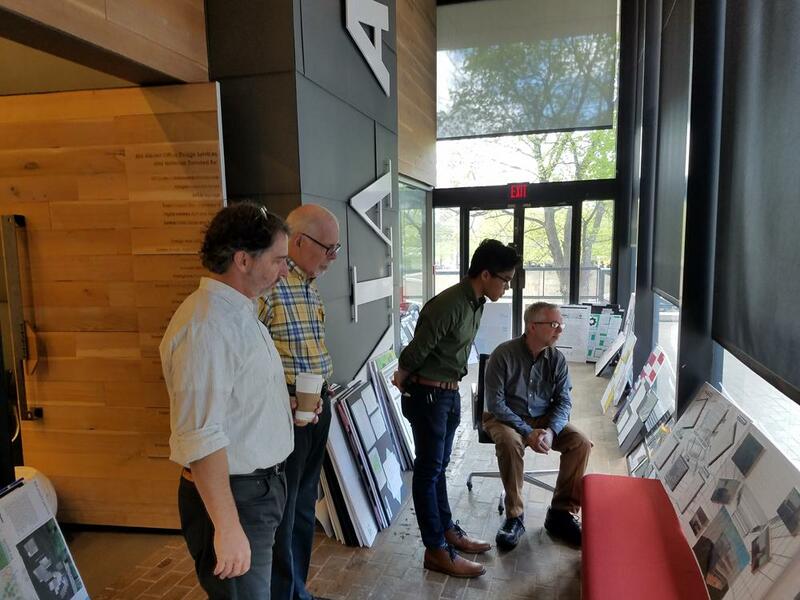 In all cases, the critics invited reflected the student's interests and the work they had been exposed to in UNCC’s School of Architecture curriculum. From the efforts of that first handful of students, CriticalMASS has fostered a tradition of collaboration and exploration across schools of architecture. Year after year, the event continues to inspire students to reach across institutional boundaries and come together with shared interests; no other such forum for cross-institution student interaction and learning currently exists. With coordination from a selected student committee and hard work from student volunteers and faculty advisors, each Spring CriticalMASS hosts a series of presentations and discussions from selected students and Distinguished Guests. Each project that is presented responds to a unifying theme but explores architectural ideas and issues independently through the lenses of technical methods, urban design, and theory. CriticalMASS Student presentations will take place on April 7th from 9:00 am to 5:00 pm. This year's Distinguished Visiting Critic is Jenny Wu of Oyler Wu Collaborative. 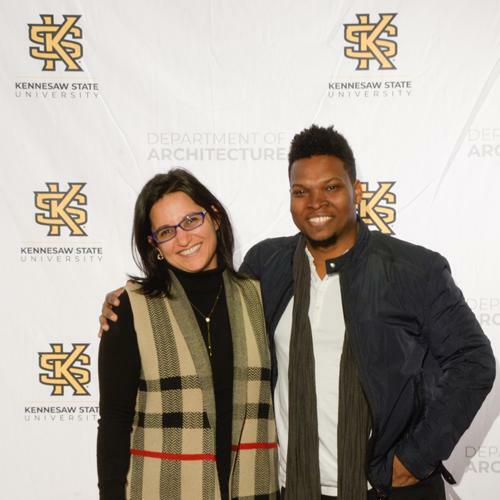 Last night, the KSU Chapter of NOMAS (National Association of Minority Architecture Students) hosted guest lecturer, Nicole Hilton, an Architect Partner at ColeHil Architects. Ms. Hilton is a native of Austin, Texas and the founding Partner and Design Architect of ColeHil. An alumnus of Louisiana State University, she is honored to be recognized as the first African American female graduate of the LSU School of Architecture to become a licensed architect. In addition to her architectural design expertise, Ms. Hilton advocates for diversity and inclusion within the design profession and design excellence. She is currently serves on the AIA Georgia Board and is an active member of the NOMA Atlanta Chapter. Congratulations to the winners of this year's 3-Minute Thesis Competition, sponsored by Cooper, Carry & Associates! On December 5, 2016 the Department of Architecture hosted the Integrative Design Studio Competition. The project was to design a new office for the American Institute of Architects and the Atlanta City Studio downtown. Students dealt with complex urban issues, building tectonics and assembly, as well as creating strong concepts. All four winning teams were invited to exhibit their work at the Atlanta City Studio at Ponce City Market Exhibition. The exhibition opens on Tuesday, January 24th and closes Saturday, February 25th. Viewing hours during that period are Tuesday - Friday: 10am - 8pm and Saturday 11am - 7pm. With their hands on the pulse of New York’s construction industry, Chris Stailey and Jacob Mashburn have worked on some of the city’s top building projects such as the World Trade Center, Madison Square Garden and Hudson Yards. The 2010 architecture graduates say they feel like a valuable and vital enterprise in the city’s regrowth, a huge boon to the city 15 years after the terrorist attacks of 9/11. Stailey and Mashburn, fellow college classmates in Southern Polytechnic State’s architecture program, were enticed to New York City after graduation by job prospects during the economic recession. The pair worked for an electrical contracting firm for several years before launching their own construction engineering firm, Agon Coordination, in 2013. “Our company is on the engineering side of construction,” said Stailey. Their firm specializes inBuilding Information Modeling (BIM), an intelligent 3D model-based process that provides insight to help plan, design, construct and manage buildings and infrastructure. 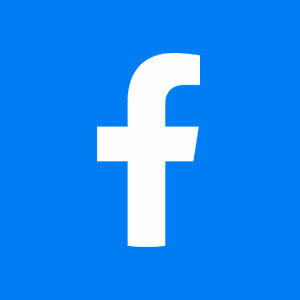 Agon – named for the suffix of shapes – provides BIM coordination. Their firm is one of only a handful of companies in the nation that specialize in a cohesive approach to BIM. “It’s a very niche market and one of the reasons why we are succeeding is because there are not many people who do it,” said Mashburn. Agon is striving to be the one-stop shop for coordinating all of the building’s systems such as electrical, mechanical and plumbing. The Agon team works as consultants between the general contractor and owner at the early design phases of building to ensure that the architect’s and designer’s needs are vetted and work with the various systems. Once the architect produces a 3D model of the building, Agon’s role is to “fill” the building, using 3D modeling, with each of the imperative systems. The pair, along with a third owner, count the World Trade Center reconstructions, Hudson Yards, Pier 17 and facilities at both Columbia and New York universities among their credentials. The World Trade Center projects, which are among the most recognizable construction projects in the past century, encompass four high-rise towers, a transit hub and a memorial for the lost. The Agon team recently provided coordination support for the retail components of Towers 1 and the transportation hub. “The World Trade Center has been one of our biggest moments early in our careers,” Stailey said, smiling. “But what a job to learn on.” Because the technology embedded within the buildings is classified, the Agon team had to obtain security clearance to work on the projects. “At our last company, we became the team that stepped in to take care of the major problems. 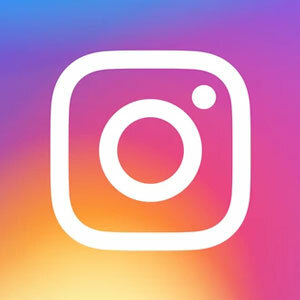 We quickly became the face of the company we were working for,” Mashburn said about deciding to start their own company. Their Southern roots – both Stailey and Mashburn are originally from Cobb County – are infused in their company values, with a handshake providing their promise of integrity on project completion. “With our training and the way we were taught at Southern Poly, we take a comprehensive approach when we look at buildings. 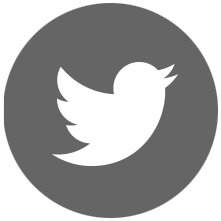 We think about it conceptually and spatially and find real-world solutions." Agon plans to expand their company into the Atlanta construction market, and have recently hired a 2014 Kennesaw State architecture graduate to join their team. 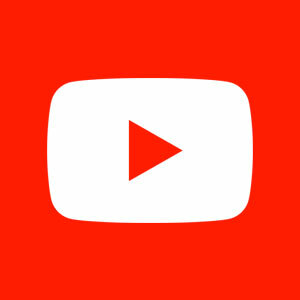 The company has four full-time and four-part time employees. The Department of Architecture is pleased to announce the winners of the annual Portfolio Prize. Each year, students seeking entry into the upper division of the B.ARCH program submit a portfolio of work as part of the documentation for consideration. This recognition goes to those students whose 2nd year portfolios scored highest among their peers. Congratulations to the winners*! Their exemplary portfolios represent years of hard work and dedication and set the standard for expectations here at KSU. To view these portfolios and the top portfolios from 2015 please visit Portfolio Examples. *The department would like to note that 1st place winner Diego Vazquez' name was unfortunately not listed in the announcement made at the kick-off meeting. The following full-time faculty will be joining the Department of Architecture this fall. Dr. Soleimani received his Ph.D. in Planning, Design and the Built Environment from Clemson University’s School of Architecture, where he also received a Certificate of Digital Ecologies. He has a Master of Architectural Design from the University of Nottingham, Department of Architecture in Nottingham U.K. and a Bachelor of Architectural Engineering from the Art University of Isfahan, School of Architecture, Isfahan, Iran. He has taught at UNC Charlotte and Clemson University and published numerous articles on his research that focuses on human-computer interaction and designing cyber-physical and tangible environments. 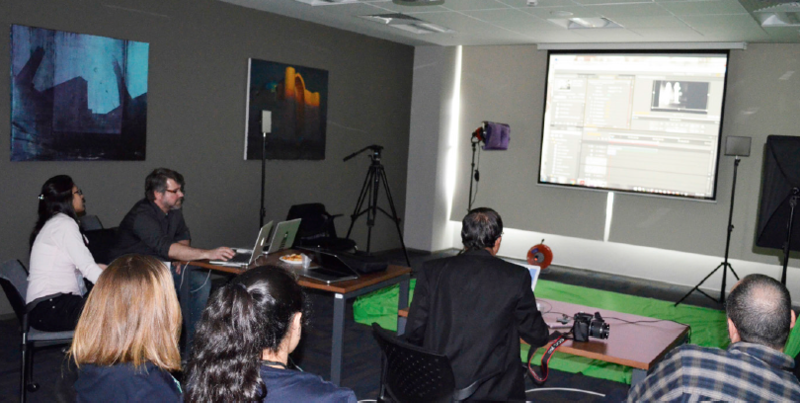 His project Cyber-PLAYce is a Cyber-Physical-Spatial learning environment promoting young learner’s computational thinking and explores the potential relationships between architecture, computer science and education. He will be teaching in the Environmental Technology sequence and Studio. Dr. Loreto is currently finishing his second Post Doctorate at Georgia Tech, this follows his previous Post-Doctorate from the University of Miami. He received his Ph.D. in Civil Engineering from the Universita degli Studi di Napoli ‘Federico II in Naples Italy, where he also received the Laurea (BS/MS, 5-year degree) in Architectural and Construction Engineering. He has taught at Georgia Tech, Univ. of Miami and Universita degli Studi di Napoli. 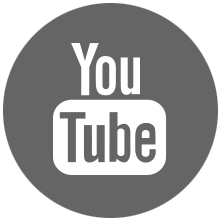 His numerous published articles address his research on sustainable construction materials, structural performance evaluation and advanced composite materials for reinforced concrete and masonry structures. He will be teaching in the Architecture Structures sequence and Studio. Professor Karimi holds a Post-Graduate Master of Architecture, Cultural Mediations and Technology from McGill University in Montreal Canada, a Master of Fine Arts, Interior Design from the University of Georgia and a 5-year B.ARCH degree from SCI-ARC in Los Angeles. She has taught at KSU/SPSU and the University of Georgia. She is also Principal of Connexion Gallery-Design Studio. She has had numerous solo exhibitions and curatorial positions and her current work focuses on tactical urbanism installations. She will be teaching Studio, Thesis Prep and in the Urbanism sequence. Dr. Okcu holds a Ph.D. in Architecture, Culture and Behavior for Georgia Tech, a Master of Science in Computer-Aided Architectural Design and a Bachelor of Architecture both from Istanbul Technical University in Istanbul Turkey. Dr. Okcu has taught at KSU, SPSU, NASA Langley Research Center in Hampton VA, Georgia Tech and Istanbul Technical University and has published numerous articles on soundscapes and the impact of noise on spatial and psychological perception. Her research seeks to develop new workflows in both education and practice that bring principles of the environment to bear in all aspects of the design process through stages of informed decision making. She will be teaching in the Design Communication sequence, Studio and Orientation to Architecture/Learning Community. 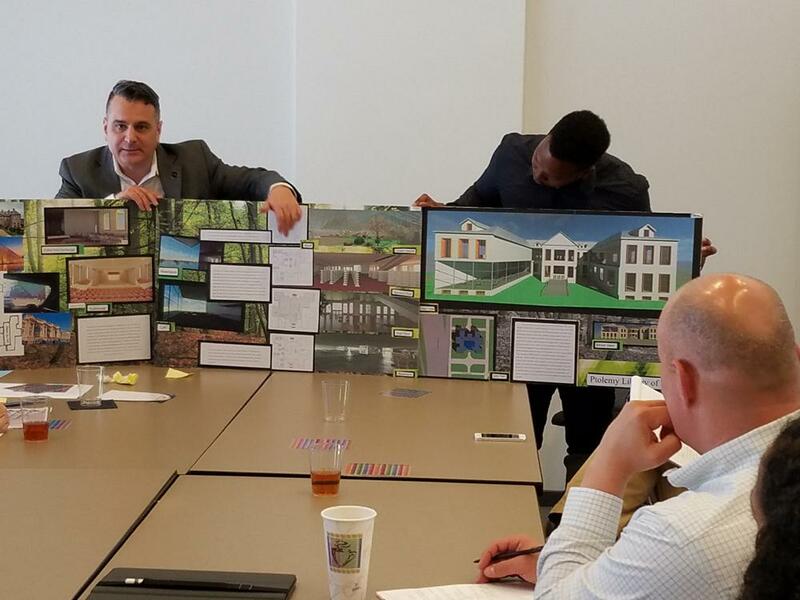 As students transition from high school to college, a unique summer intensive program has given nearly 80 incoming first-year students a sneak peek into the architecture program at Kennesaw State. The three-week introductory program, called the Summer Design Workshop, acclimates new students to the studio design experience. Students explored 2D design with simple geometric composition to “learn the visual language of architecture,” said Uddin. Students quickly progressed to 3D design, using several techniques to explore surface-to-volume theories, and sketched free-hand observation drawings. Students worked with tools of the trade, such as rulers and proportion scales, to move their ideas from paper to scaled models. Besides lectures and hands-on studio time, the intensive study provided students with daily feedback and critiques of their work, coined a “deskcrit,” from among the seven faculty who worked one-on-one with students. Critique is an essential part of the architecture program, explained Tony Rizzuto, chair of the architecture department at Kennesaw State. The Summer Design Workshop is a non-credit, non-graded immersive study that is optional for new students. A majority of first-year architecture students elect to participate in the workshop, now in its ninth year. While some students may have taken computer-aided design or drafting courses in high school, this is the first foray into architecture for most students, Rizzuto added. Students gained skills in manipulating their designs and reworking their ideas. They were able to digitally test their designs using software, as well as draw sketches and construct models using a variety of materials. All of these elements came together at the final presentation and exhibition for parents on the last day of the workshop, Uddin explained. Beyond the studio session, first-year students learned about time management, work ethic and meeting deadlines, but were also provided tips and advice from about 20 senior students, including members of three architectural student organizations, including the American Institute of Architecture Students (AIAS), Alpha Rho Chi Fraternity – Polyidus Chapter (APX) and the National Organization of Minority Architecture Students (NOMAS), who volunteered their time to help the first-year students. “I like that we had the opportunity to meet people, scholastically and socially, ahead of time,” said Caleb Hester of Lawrenceville. Students worked alongside each other on projects, ate meals together and became acquainted with their future classmates. 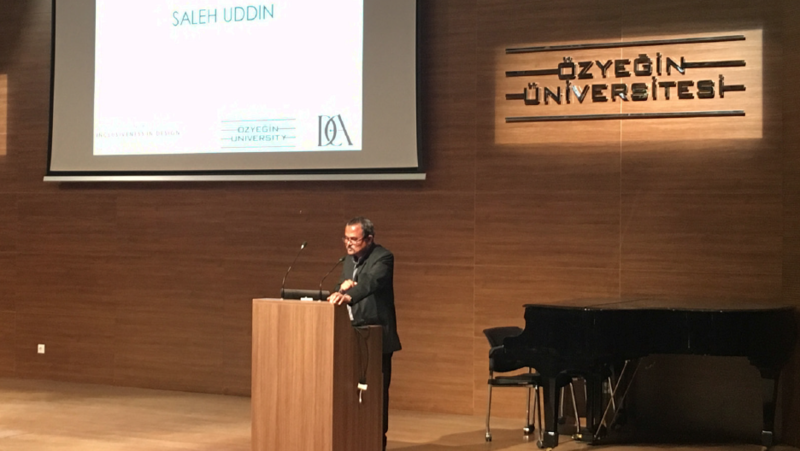 “Our architecture students now have a better understanding of the fundamentals of design, composition and drawing, which is the synthesis of the whole three weeks they’ve spent working together,” Uddin said. This past week, the Kennesaw State University Department of Architecture hosted The National STEM Guitar Project. Program participants, including local high school and technical college STEM (science, technology, engineering and math) teachers, spent five days in the Architecture Wood Fabrication Shop working on custom electric guitar design/build projects. Alex Ross, age 18, just graduated from North Gwinnett High School and is heading to Kennesaw State University in the Architecture Program beginning fall of 2016. Like many other graduating seniors, he is excited to spend this summer hanging out with friends and getting ready for college. But, unlike his classmates, he will be completing a project that has been four years in the making: a 26 foot long model of the Titanic ship. The impressive structure currently resides in Ross’ basement but will soon be moving to the new North Gwinnett Arts Association (NGAA) Center for the Arts in mid- July. NGAA’s facility in Suwanee Town Center, is the hub of our art community, offering art school, workshops, classes, space for artists to work and display their creations, summer camps, parents nights out and more. It is dedicated to celebrating and promoting our local art culture and to giving both children and adults the resources to pursue the arts. Vickie Johnson, NGAA President, first heard about Alex Ross from Corey Holdrich, Stylist at Hairllucinations Salon. While Ross was getting his hair cut from Corey he showed him pictures of his Titanic project. Holdrich was so impressed and knew it was something that had to be shared with the community, particularly his friend/client Vickie Johnson. “When Corey first told me about it I had no idea how huge this was until I actually saw the pictures…it’s very impressive and I’m so excited to have it in our Center!” Vickie said. Ross first became interested in the history, magnitude, beauty and tragedy of the Titanic after learning about it in his 7th grade class. At that point his parents bought him a small-scale Titanic model kit; which was admittedly fun to build, but he had much grander plans in mind. During his freshman year of high school those plans started becoming a reality. Ross built the model from historic blueprints of the actual ship. “One time I threw out the entire front section of the ship (and hours of work) because it wasn’t perfect. I want it to be as historically accurate as possible… it’d be really cool if it even ended up in a museum one day,” he said. Ross uses everyday resources to construct the display, including tools such as: cardboard, wire, popsicle sticks, wood, LED lights, electrical wiring, modeling clay and paint. He is resourceful and economical with his tools. “I first started building it from a pile of Amazon boxes I found in the basement,” he said. “Now whenever my parents get something shipped to the house they throw the box down the stairs for me,” he continued. He painstakingly details every aspect of the ship: inside and out. The original ship was covered in rivets, and when his model is complete there will be close to 50,000 hand-created rivets on it… each individual dot made with glue. He has added cracks and splinters in the ship deck in the exact location where the Titanic split before sinking. Inside the model ship he has added tile flooring, staircases, lighting, seats tables, doorways, railings and other details – all based on actual photos of the Titanic. “It’s hard to say exactly how many hours I’ve spent on this project,” Ross said. “But I started my freshman year of high school and during the school year would probably spend 2-3 hours/day on average and much more time during the summers. There were times in the summer when I’d spend all day working on it,” he admitted. The hours have already started to pay off. When applying for the Architecture Program at Kennesaw State, Ross submitted photos of the ship and the University staff had never seen anything like it. He is now excited to pursue his passion at the next level. “Hopefully this will evolve into a really cool career…I would love to build buildings or even the inside of ships,” he said. The NGAA will be hosting an open house reception when the model ship is moved to their Center for the Arts. For more information about the North Gwinnett Arts Association, visit www.ngaa4arts.com. Being invited to show artwork at Venice's Biennale would be considered a career highlight by many, and two Atlanta-based artists are among those holding that honor. The bi-annual contemporary visual art and architecture exhibition opened among the canals and plazas of the Italian city in late May. The work of William Carpenter, architect and founder of design firm Lightroom, and sculptor Bojana Ginn, titled "Presence," is currently on exhibit at the famed event. "In this collaboration, what we've really tried to do is elevate both of our games, both of our approaches," Carpenter says, referring to the combination of Ginn's work with light, projection and sculpture along with his own architectural elements. "We're really trying to redefine the normal practice of architecture and move [...] into the fine arts." Both Carpenter and Ginn called the invitation to exhibit work at the Biennale an honor, though one that presented challenges. The pair raised funds through local gallery owners and patrons to make the trip to Italy, but also required research and trial-and-error in getting the work there. "We were a little bit ..." Ginn hesitates, "should I say scared? Because we were preparing work for something that is across the Atlantic." Ultimately, "Presence" traveled to Venice packed into suitcases. "There was so much work involved," Ginn says, "that I feel that right now after everything is done [that] I can actually look back and see what happened." Once the work of putting their exhibition was through, however, Ginn thrilled at the experience of attending the exhibit. "Just walking endless hours from one exhibition to another," she says, "like a kid in a candy shop … it was overwhelming. " Laura Sherman was working in her Integrated Design Studio class last semester when she stumbled upon a call for entries in The American Institute of Architects (AIA) student design competition that seemed perfectly suited to her latest architecture project. Her design was selected recently by the AIA Committee on the Environment (AIA COTE), in partnership with the Association of Collegiate Schools of Architecture (ACSA), as one of 10 recipients of the AIA COTE Top Ten for Students. The national competition, now in its second year, recognizes 10 exceptional studio projects that fuse innovative, regenerative strategies within broader architectural design concepts. Sherman’s project was selected based on her integrated approach to architecture, natural systems and technology. Her project, "O2O4W: Oxygen House in the Old Fourth Ward District", proposes a new facility on the site of the soon-to-be-demolished Martin Luther King Jr. Natatorium in Atlanta. The MLK Natatorium was a social and activity hub for the surrounding neighborhoods but was determined to be structurally unsound. As part of their studio design proposals, students were required to introduce a new community amenity, along with a center for lung health and well-being, explained Edwin Akins, associate professor of architecture, who teaches the Integrated Design Studio course in the College of Architecture and Construction Management at Kennesaw State. To meet the requirements, Sherman’s design included a community room, an outdoor pool with supporting facilities, a childcare center, an extension of the existing gymnasium and a public café. As part of the studio course, students were asked to combine a lung cancer or asthma consultation clinic with their public outreach programs. Sherman explained that this was very difficult because the programs introduced dissimilar requirements for private and public spaces. The ground-level community center that she designed acts as a pillar to the upper-level consultation clinic by providing community support and awareness, she explained. “This project was about balancing many things: technology, sustainability and the structure of the building. I also had to consider how it feels to be a cancer patient or a resident of a neighborhood,” she added. To meet the requirements of the AIA competition, Sherman’s project had to meet some additional criteria, which Sherman worked on between semesters with the help of faculty mentor Edwin Akins, who helped her to refine some of the technical aspects. Akins said that Laura and her classmates were a strong group who integrated their passion for learning and environmental stewardship into their assigned projects. “I am so proud of her work and the work of all of our students in the Architecture department. They are a committed and talented group of young adults who are proving to be true leaders in the field,” he said. The AIA competition program challenged students to submit projects that provide architectural solutions to protect and enhance the environment. Sherman said that the most interesting part of creating for the AIA competition – and architecture, in general – was trying to solve a complex problem through design. Sherman’s work has been honored a few times this year, leading up to the top AIA student award. She earned first place in the department’s comprehensive design studio awards at Kennesaw State. Sherman and two of her classmates were also the only three students in Georgia honored by the 2016 AIA Georgia Design and Honor Awards for their innovative design work. In addition to the Merit Award, Sherman also earned the People’s Choice Award for her project. Sherman’s honored work will be on view at the AIA Annual Convention in Philadelphia in May and the ACSA annual meeting in 2017. 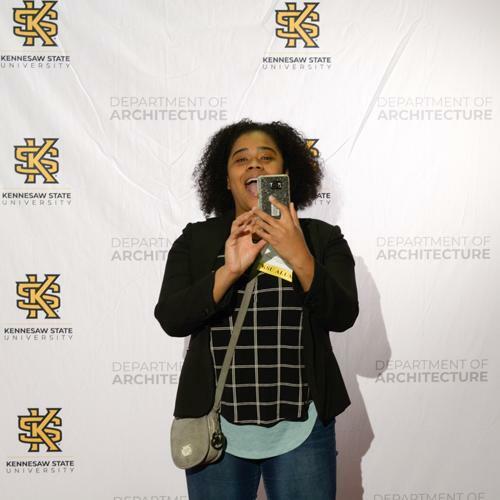 Beyond her design work, Sherman is a Goldgeier Scholar, which provides an annual scholarship award to a deserving architecture student at Kennesaw State. She also is the recipient of three other scholarships, including the James G. Fausett Scholarship, the AIA Dorothy P. Spence Scholarship, and is the first recipient of the Jeremy Smith Memorial Scholarship. Because of Sherman’s desire to give back, she recently led a group of architecture students in hosting a fundraising event, which raised several thousand dollars during the Jeremy Smith Scholarship Fund Napkin Sketch Gallery Auction. 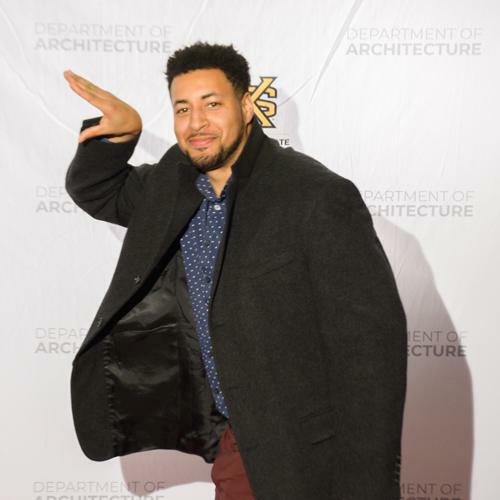 Hakim Hasan, (KSU Architecture, B.ARCH 2015) will be teaching a workshop entitled “Design Space Construction – Defining, optimizing, and communicating performance-based building design spaces” at the upcoming ACADIA (Association for Computer Aided Design in Architecture) Conference, to be held at the University of Michigan Taubman College in Ann Arbor, Michigan, October 27 - 29, 2016. Hasan will be representing Perkins + Will, where he currently works as an Architect for their Atlanta firm. In addition, KSU Architecture Professor, Bill Carpenter, was selected as a finalist in the "Design + Innovation, Built Projects" category, for his project “Paty Modern” for Lightroom. All of the finalists were nominated for the “People’s Choice” award, along with a project from a fourth KSU Architecture student, Brandon Aultman, for his project, “O4W Oxygen House”. 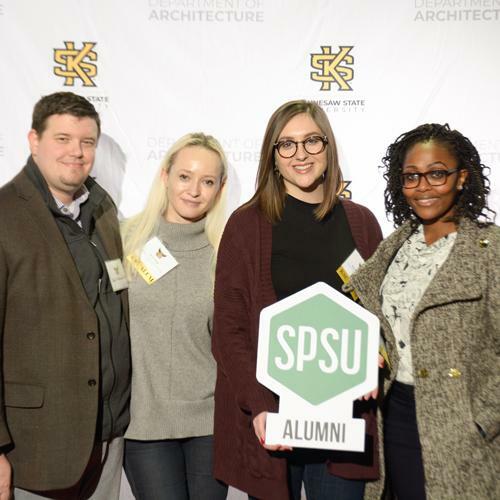 Ten Kennesaw State University Architecture students and Assistant Architecture Professor, Tim Frank, participated in the Technology Student Association (TSA) State Leadership Conference (SLC), held at The Classic Center in Athens, Georgia March 16 - 19, 2016. During the conference, KSU students mentored middle and high school students interested in science, technology, engineering, arts or mathematics (STEAM) career paths, as well as their advisors. The KSU participants also judged competitive events, including fashion, photography, CAD drawing, architectural renovation and video game design. Participation in the TSA SLC provided the College a great opportunity to interact with high and middle school students from all over the state who display self-drive and motivation in the areas of design and technology. 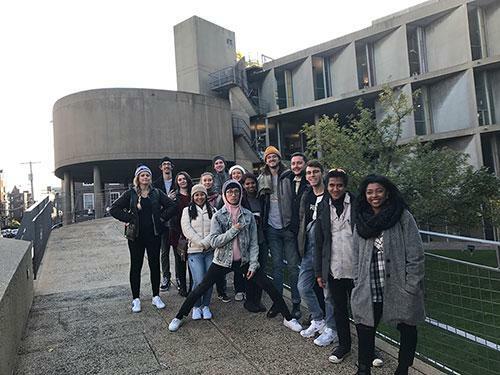 This semester, KSU’s Architecture students decided to visit Chicago as part of the Department of Architecture’s ArchiTours Program. 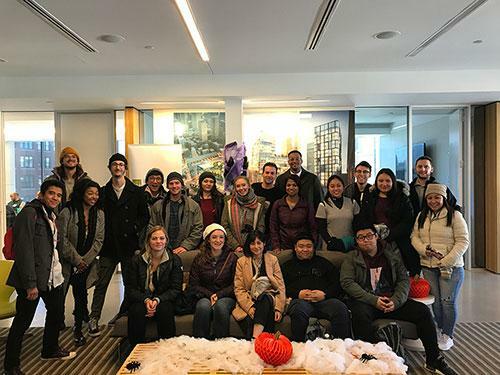 Dr. Setiawan and seventeen students spent three days (March 17 - 20) exploring and analyzing architecture in the windy city. On March 11, 2016, Julie and Jim Kimball of Canton joined in a signing ceremony with College of Architecture and Construction Management Dean, Rich Cole, to formalize their philanthropic commitment to benefit students in the Department of Architecture. 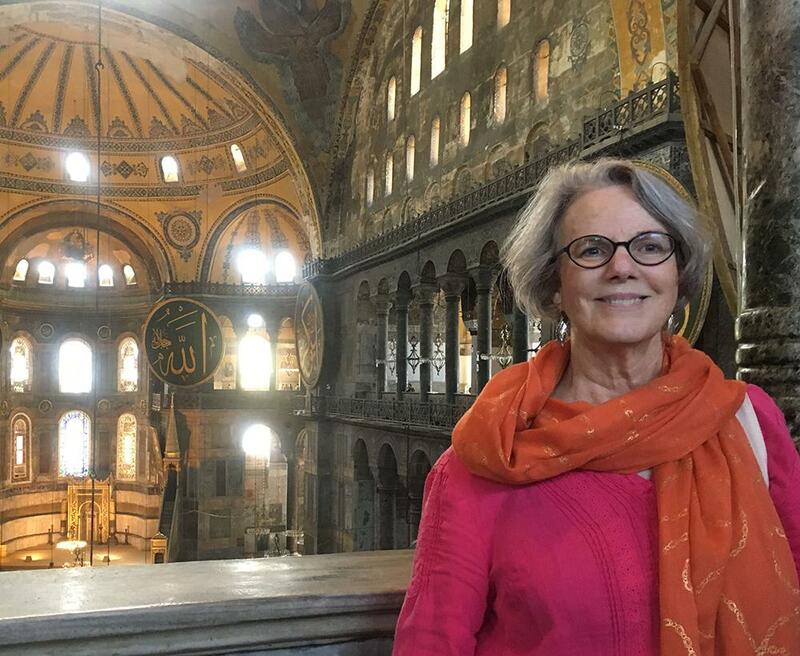 Julie and Jim are in the process of fulfilling a pledge to endow a travel scholarship to assist deserving architecture students to travel on domestic or international study abroad programs sanctioned through the Architecture Department. Also participating in the signing ceremony was son Jason Kimball, BArch 2008. Photo showing architecture student 3-Minute Thesis Competition participants (left to right): Jonathan McConnell, P.K. Amponsah, Jun Xu, Landon Clark, Asta Varneckience, Kushal Patel, Kris Goettig, Michael Diaz, and James Logan Patterson. Registration is now open for the 13th Annual Jim Fausett Golf Classic on Monday, April 4th, at the prestigious TPC Sugarloaf Golf Course and Country Club. This Greg Norman designed course is Home of the PGA Senior Open. Proceeds from registration go to the Jim Fausett Foundation, which provides scholarships to deserving students in the Department of Architecture at Kennesaw State University. The annual Focus Studio is an intrinsic part of the professional core of the Architecture Program and is designed to foster a strong relationship between the program, our students, and the profession as a whole. The Fifth-Year Focus Studios are intended to introduce the student to design research and its application, while adhering to creativity, critical thinking, processes of making and constructability. Each Focus Studio is unique. As such, it is imperative that each Focus Studio Critic have the academic freedom to establish his or her own studio culture, pedagogy, and evaluation criteria for the work being produced in his or her own studio. The upcoming Forum and Exhibition will unfold the work of three Focus Studios during Fall 2016. Architecture Alumni Matt Finn publishes article “Choose Honest Materials that Agree with the Sense” in Behavioral Healthcare. Kennesaw State University’s architecture students latest design innovation, “Urban Blanket” is installed at Centurgy in Midtown. A “public space for lounging, flirting and working” it is constructed from HI-MACS, an environmentally friendly material often used for kitchen countertops, the blanket is a molded architectural platform that stretches 12 feet by 12 feet in a continuous surface or landscape, making it ideal for lounging. The Urban Blanket demonstrates that urban space can be upgraded and appropriate for the digital age. The work will remain at Centurgy until July 24th 2015. 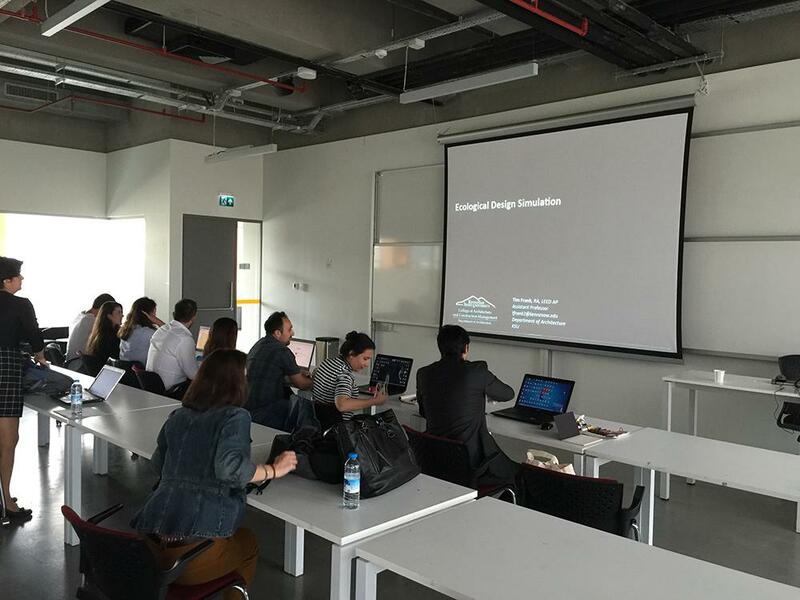 Incoming Architecture Students started the Summer Design Workshop on July 13th. This three-week head start program introduces students to studio culture, basic design concepts, tools, techniques and processes of design and, as well as providing introductory lectures and videos on Architecture. Students will also meet and work with the various student organizations AIAS, APX NOMAS and SGA. An exhibition and opening reception of student work will be held in the Architecture Gallery July 29 from 4:30-6:00pm. Summer Design Workshop Incoming Architecture Students started the Summer Design Workshop on July 13th. This three-week head start program introduces students to studio culture, basic design concepts, tools, techniques and processes of design and, as well as providing introductory lectures and videos on Architecture. Students will also meet and work with the various student organizations AIAS, APX NOMAS and SGA. An exhibition and opening reception of student work will be held in the Architecture Gallery July 29 from 4:30-6:00pm. 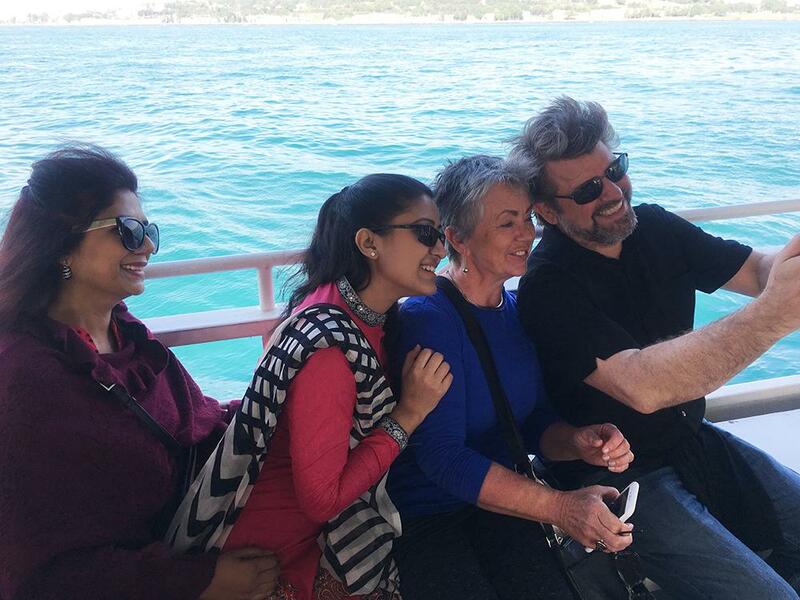 Study Abroad Architecture students and faculty took their studies abroad this summer. Professors Akins and Martin taught students in Paris and Edinburgh respectively, as part of the European Council Study Abroad program. 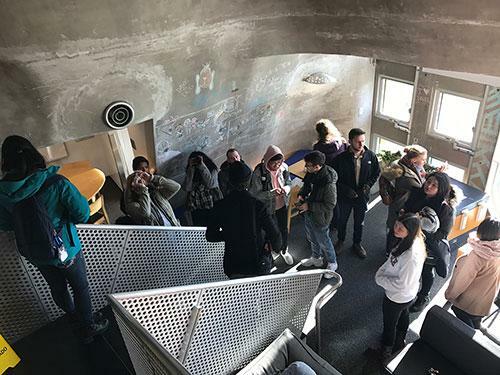 Professor Carroll took a group of students on an ArchiTour to Barcelona and Dr. Shpuza again took students to Dessau as part of the Germany exchange program. Faculty from the Department of Architecture have been presenting their research in conferences around the world this summer. Dr. Shpuza presented ‘Migration of Syntactic Core during City Growth’ at the 10th Annual Space Syntax symposium in London and ‘The Effect of Terrain on Topological Characteristics of Street Networks’ at the 22nd International Seminar on Urban Form in Rome Italy. 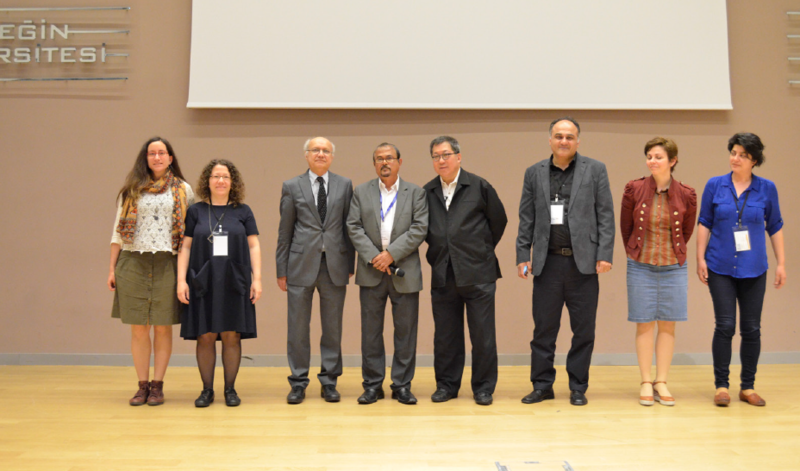 Professor Frank presented his paper ‘Envisioning Our First-Principles Predecessors: The Legacy of Climatization within Ancient Anatolian Structures’ at the EAEA 12 Conference in Lodz Poland. 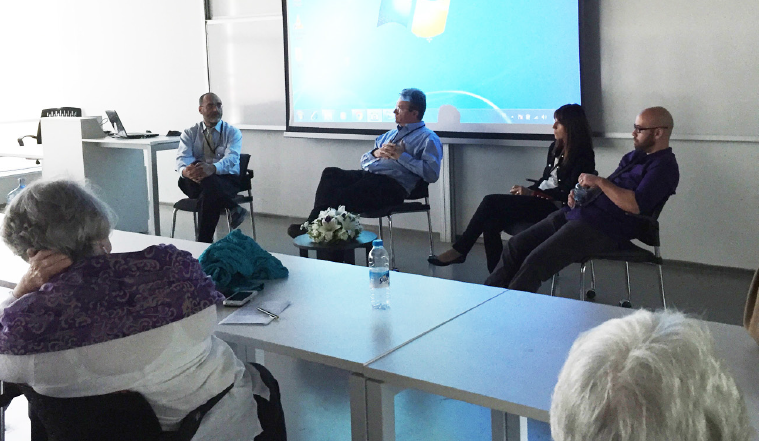 Dr. Hashas attended the Study Space Warsaw Workshop in Warsaw Poland. 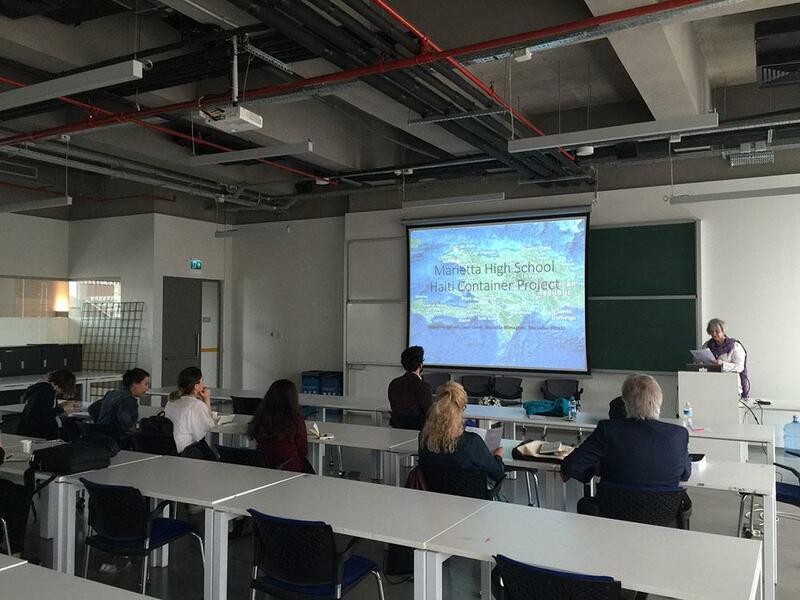 Professor Dytoc presented ‘Graphic Learning Strategies to motivate Structures Education’ at the 5th Annual International Conference on Architecture in Athens Greece. Dr. Zamani presented a paper in Brighton England at the European Conference on Sustainability, Energy and the Environment.